Usually on a cold wintry day I need no excuse to stay inside in the warm. Today was different. 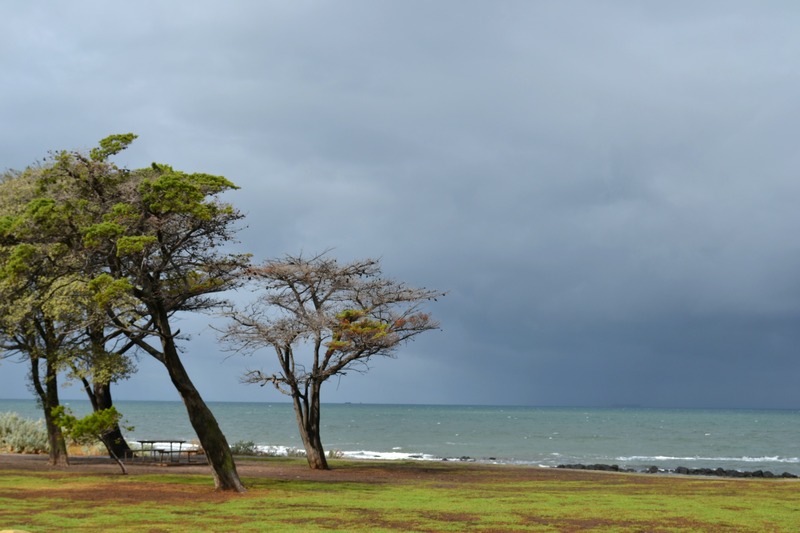 We spent a lovely morning ambling along black rocks in the wind and squally rain along the sea front at Williamstown. It was an area where dogs are allowed to be off leash and Billie relished this chance to sniff and run to her heart’s content. Of course she got wet and muddy and tried to drink the ocean, like she always does. I loved having the sea wind blowing into my face. 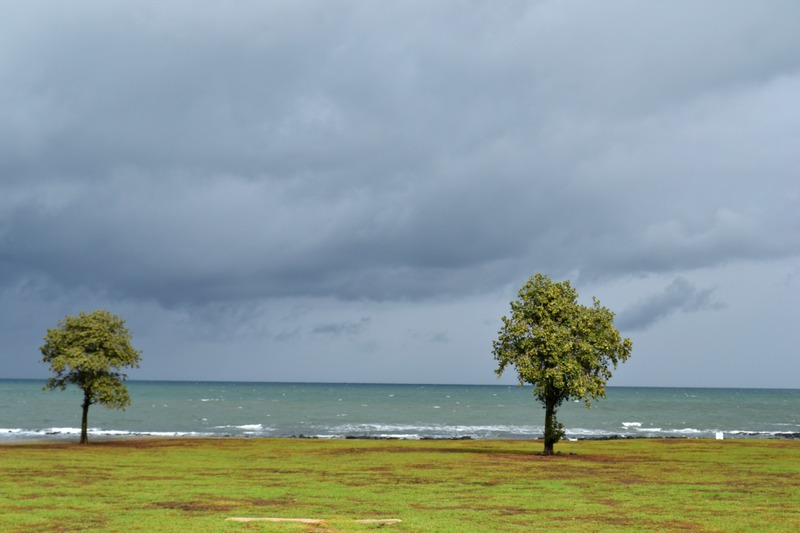 The closeness of the sky and the bleakness of the weather made me feel isolated, in a good, a welcome way. 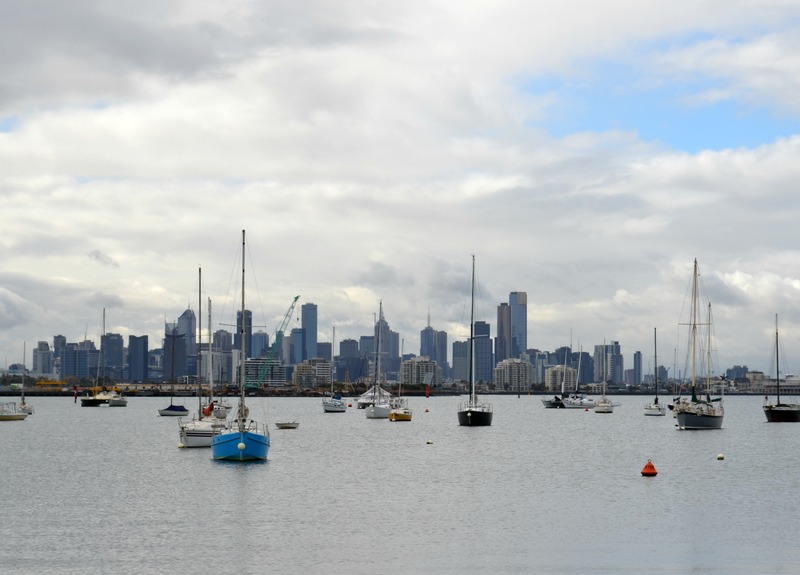 Afterwards we went around to The Strand and feasted on fish and chips with the city of Melbourne as our back drop. I almost bought a green scarf – with birds on it. But I decided it was really mostly the colour green I liked and I had some fabric that colour, I could make myself one. 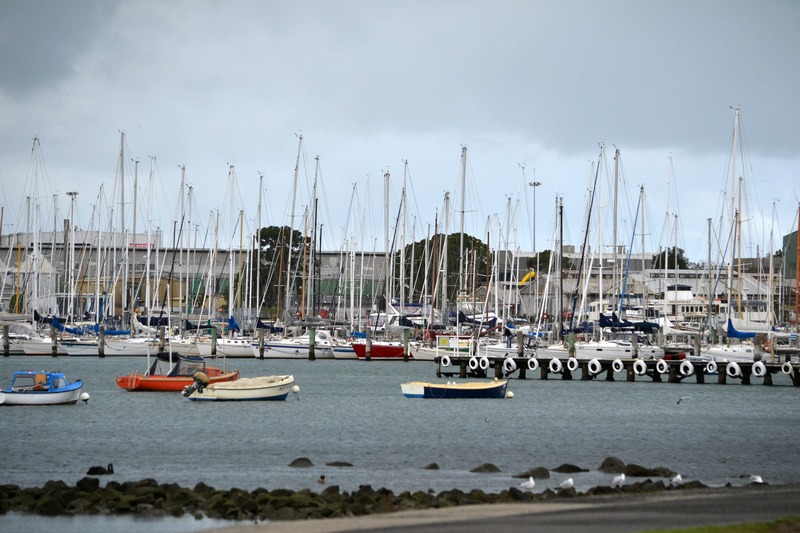 When I have been to Williamstown in the past it has been in the summer. It is a different place then. Today it was moody, and romantic and I could imagine myself living here. Here it is April and is there any point posting my monthly nine for the last two months? I decided I would, for my own records. I am surprised by how quickly I forget what happened, when. 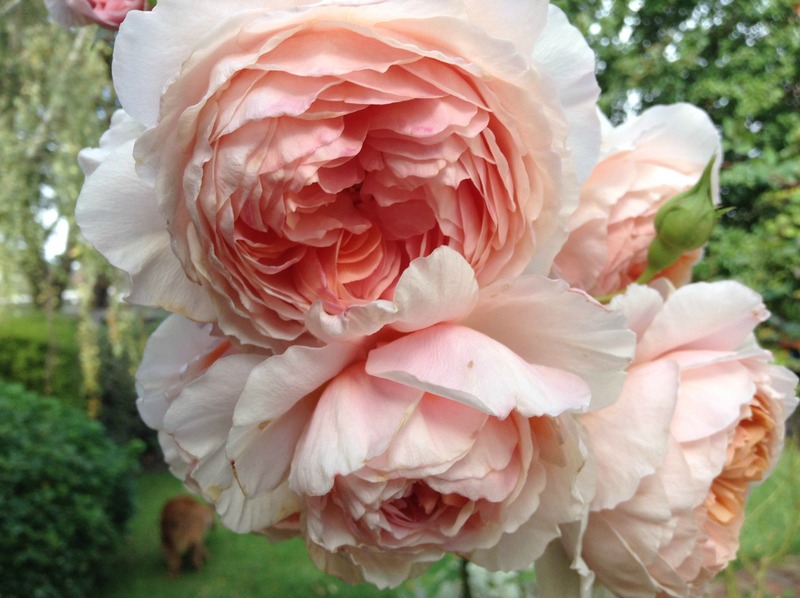 I am not linking this post with the others but Linda from Greenhaven hosts the monthly nine round-up, having taken over from Christine who began the series a number of years ago and thought up the nine categories. Rhubarb from the garden is always a delight to me. Mostly I bake it in the oven and serve it cold for breakfast – with yoghurt and seeds or rice porridge. Gluten free pizza is also a popular menu item at the moment. Valentine’s Day called for a heart shaped pizza. Perhaps the favourite ‘thing’ over the last two months has been capsicum stuffed with grated cheese, grated carrot, chopped tomato and some cooked or canned corn kernels, then baked in the oven until the capsicum looks cooked. Red capsicum is best but any will do. It is really delicious! We enjoyed various salads on the last warm days in February – and on a couple of occasions, carrot fritters, a tabbouleh made with brown rice, hummous and lovely in season watermelon. Talking of ‘in season’ I purchased superb organic unwaxed apples at local farmers markets during February and March. Cool nights in March inspired the making of soups. One weekend it was pea and bacon bone and another it was pumpkin, with enough of each to put some in the freezer. 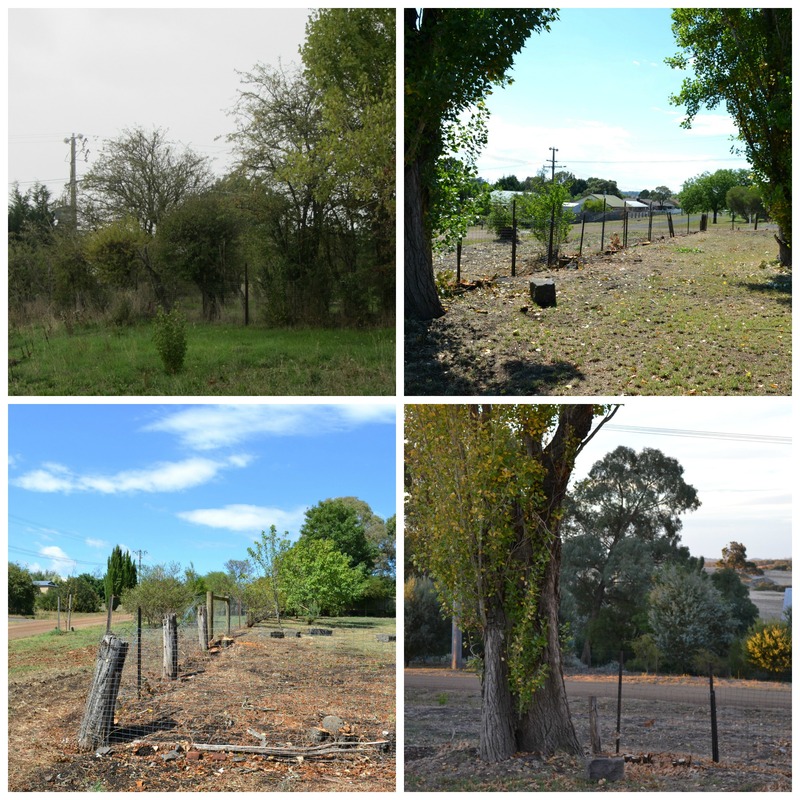 in February we had the hawthorn bushes from along the front fence line of our country house removed. The photo shows a before and three after. In March we met with a garden designer and began planning our garden. We learned about the trees that are already on the property – and that they need a lot more water. A Chinese Elm, if watered well should help to provide some shade on the western side of the house, and some Manchurian Pear trees on the eastern side will do the same. By the end of March though, we had instructions for how to draw a plan, lots of ideas about what to plant, and some tips for soil preparation. So a long way to go yet. We decided that the old tank we were going to dispose of would serve as a shelter for firewood. Some Besser Bricks were purchased, then placed inside the tank and covered with old iron that had been left on the property – all ready for a delivery of firewood. 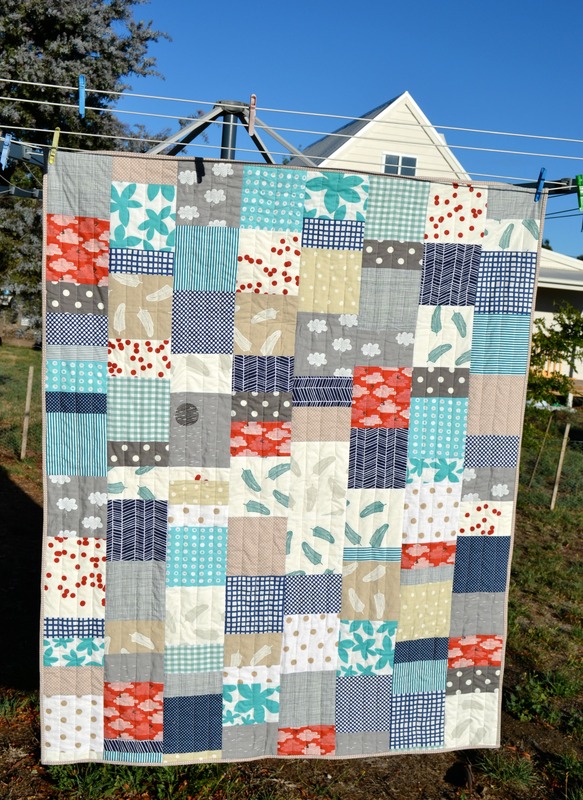 I also looked at my stash of fabric scraps to see what I could make with them and made a quilt. At the country house I planted spinach, parsley, sweet peas and daffodil bulbs. All things I hope might survive and thrive without my having to be present everyday to water and nurture them. The city garden is in need of a tidy up. Some herbs are getting a bit rambunctious and lettuces have gone to seed. And the raspberry canes need cutting back. We had lots of extra insulation put into the ceiling and under the floor of our country house. 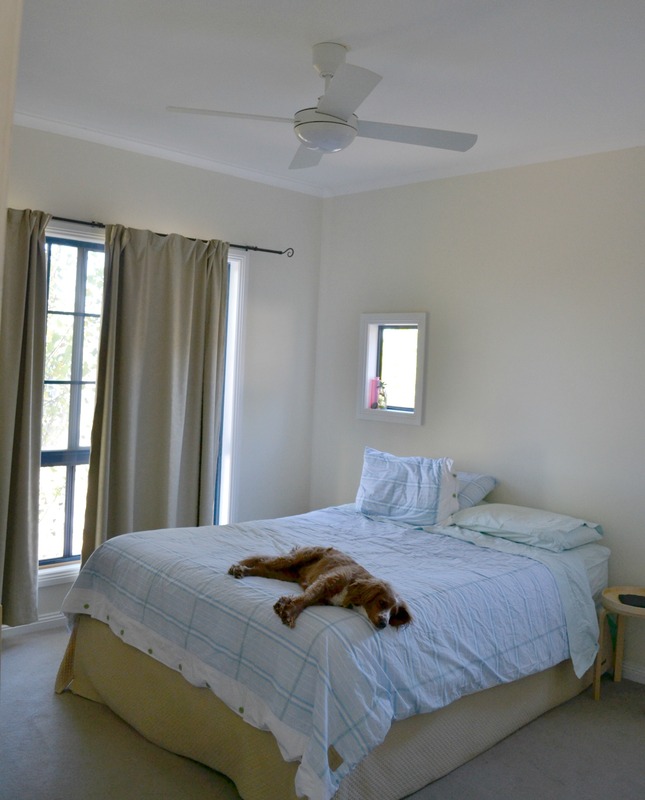 Ceiling fans with LED lights were also installed in four rooms. Solar panels are also being researched and costed and we applied and were successful in gaining permission for the maximum amount of solar panels allowed for our house. I enjoyed making two outfits for two little sisters. 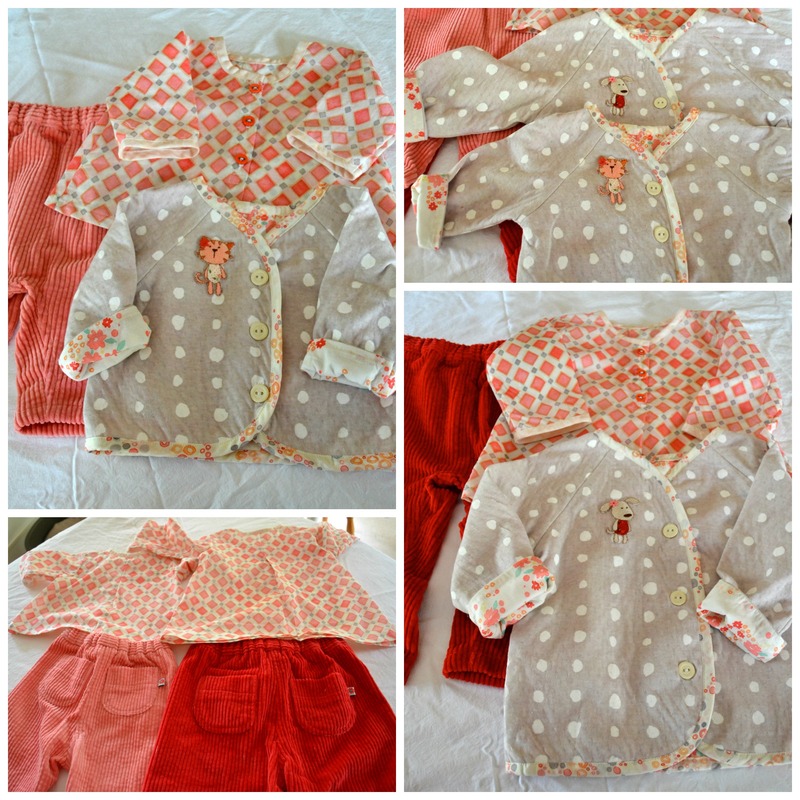 The jacket was made from lovely soft Nani Iro knit fabric. This was lined and bound with a Cloud 9 organic cotton. Another fabric from this Cloud9 range was used for the front buttoning shirt. Pants were made from soft wide wale corduroy that I have been hoarding for a long time. Both were scraps left from other projects but were just enough to make these little duds. 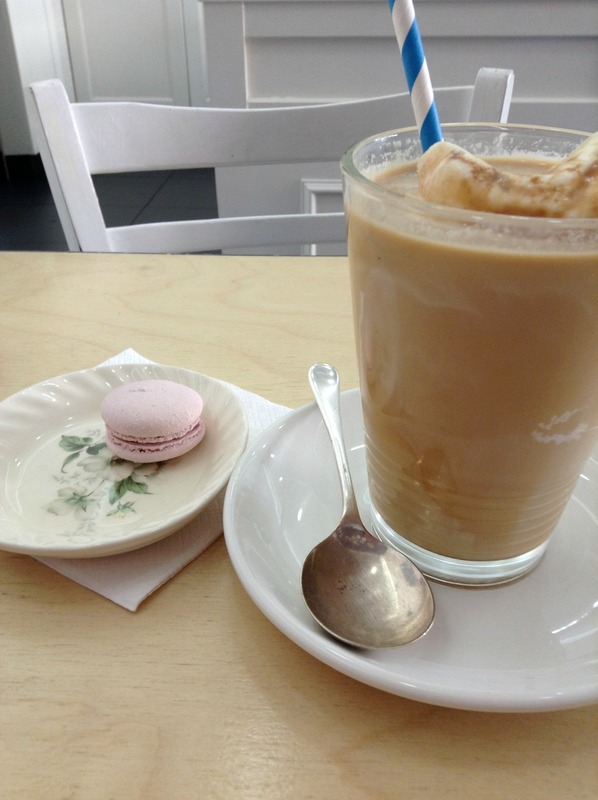 I spent a lovely Sunday afternoon discovering the delights of Sydney Road, Brunswick, including live Italian music at the cafe were we lunched and a very pretty little french cafe that served delectable mini macaroons – I chose violet flavoured. YUM! I loved looking in the window of the Moroccan shop, and spent a long time browsing in a bookshop. I did wish some more of the fabric shops had been open but it was probably just as well they weren’t as I might not have been restrained enough to ‘just look’. Thanks to my local library, I also discovered Instagram and got hooked. Saturday mornings at Farmers’Markets have very much added to my sense of being part of a ‘community’. I really appreciate that they exist and hope to do my little bit to support the local growers and makers. Besides the produce is so much better quality than available in retail stores. The birth of a new baby (end of Feb) and a birthday (March) were both causes for celebration. Meals out and with friends were enjoyed. Autumn is a beautiful time of year and it seemed that it came early this year. Before February finished we were well into an autumn weather pattern. I can take a lot of cool crisp mornings and sunny days! What a lovely month January was. It felt like the whole neighbourhood was on holidays and even though it felt much longer than thirty one days, I wanted it to go on and on. 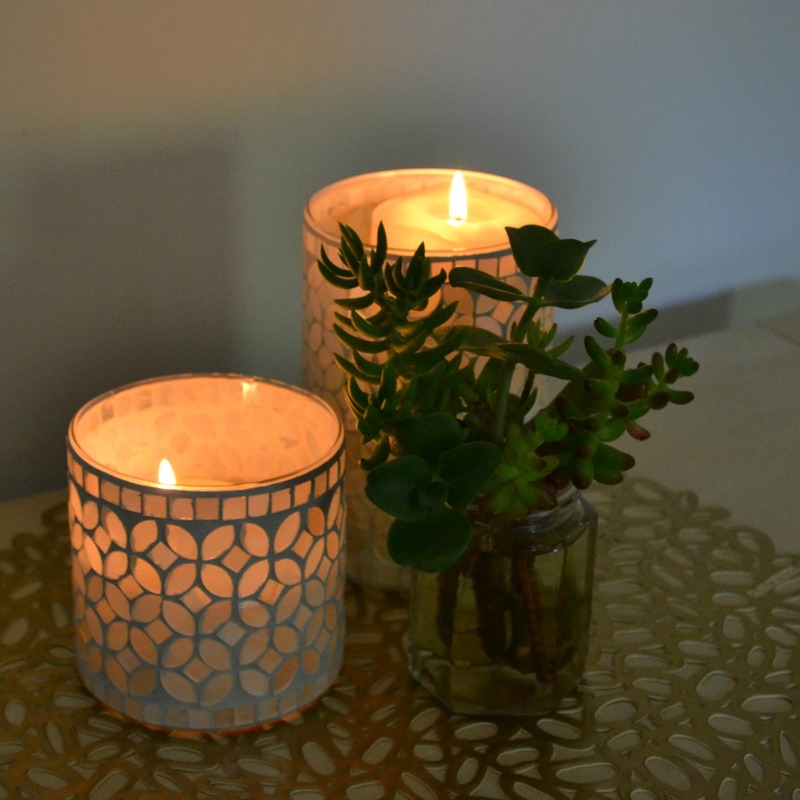 The quiet streets, ABC Radio’s summer programs, long days of sunshine and gentle evenings made for a peaceful, contemplative month. It is amazing how quickly I forget what happened from one month to the next. That is why I love joining in with Linda from Greenhaven and others with the monthly nine: I like the record it keeps but I also love to be inspired by what others have done with the month just gone and the categories that Christine came up with are great goalposts for me in bringing my hopes and intentions just a little closer to practice. 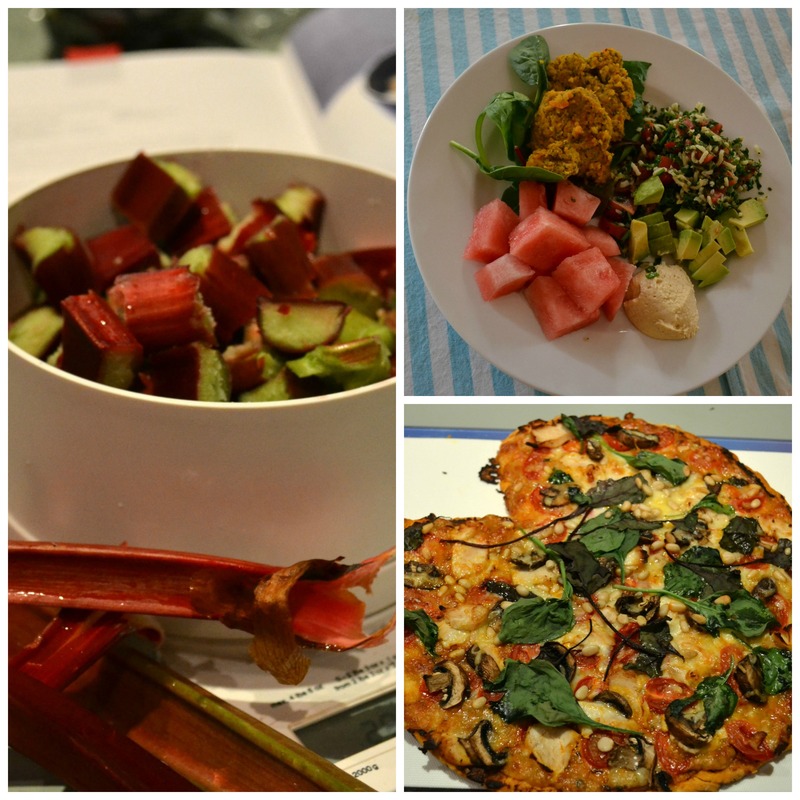 Lots of salads and less time cooking definitely contributed to the relaxed feeling that was January. 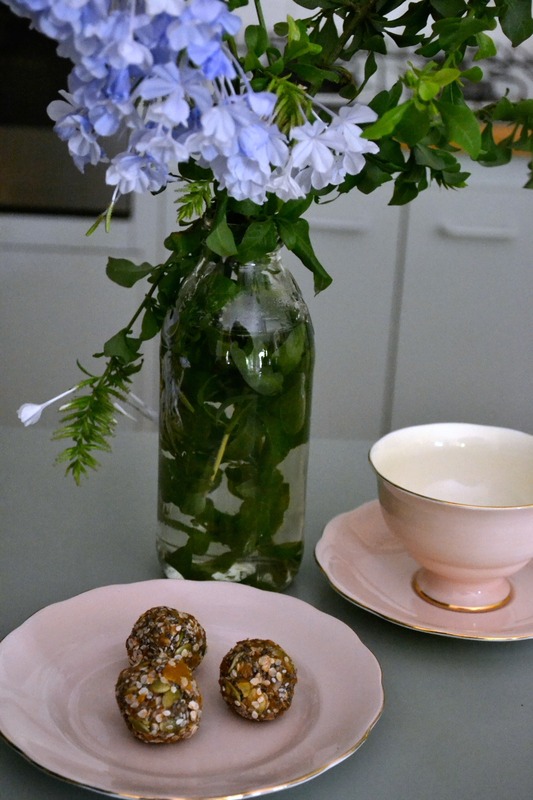 Preparing for a morning tea gave me the chance to try out some new gluten free snack recipes. These two were my favourites: barbecue flavoured popcorn and apricot and chia balls. With the later I substituted quinoa flakes for rolled oats to keep it gf. Stored well both keep fresh and delicious for quite a long time (popcorn in airtight container and apricot balls in fridge). I used a Christmas voucher to purchase a yearly planner and some other planning stationery. I cut up on old calendar with photos i liked to make monthly dividers. At the start of each month I have a ‘to do list’, then for each week there is a weekly layout for meal planning, with a tear off shopping list, then a weekly goal planner for each week of that month with tick boxes for tasks related to these goals for each day. These goals are more the aspirational ‘big picture’ intentions rather than the day by day ‘need to do’ things. Then there are the pages that have a section for each day, with a view of the week. I use bullet journaling in this section – though mostly it is a list of what I need to get done each day. It is working really well for me. 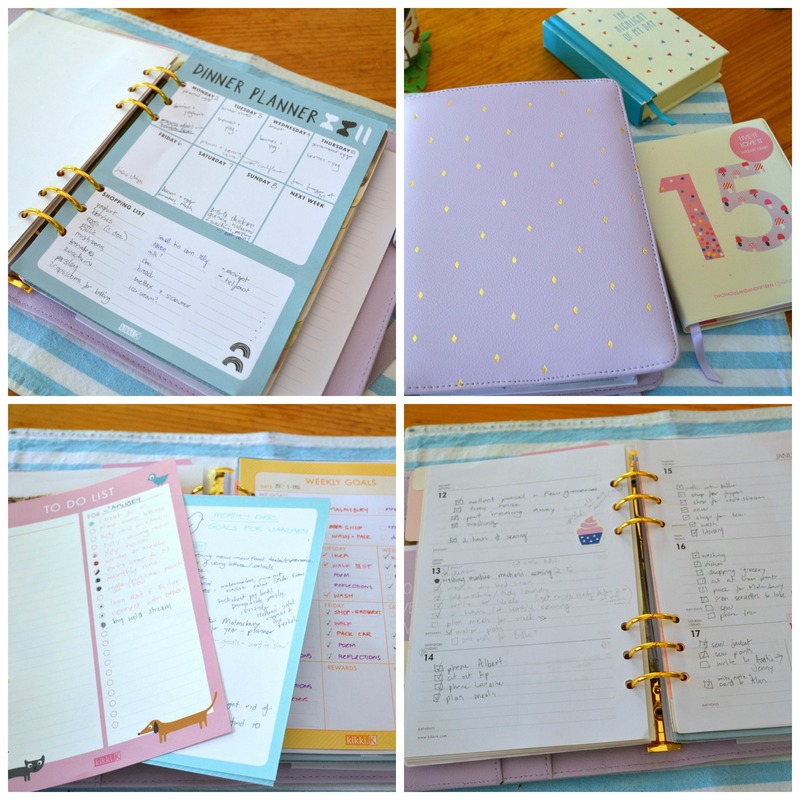 I am finding having all these planning tools together and in such an easy to use format means that I use them. I love ticking things off from yesterday at the start of each day. I’m sure this is the most organised I have ever been in my life. I hope it contributes to a sense of living intentionally and well. I have also added pages in each month for the monthly nine categories. At the start of the month I list some of the things I would like to accomplish in each of the nine areas, and then as the month goes by I add things I might actually have done. My intention for this month was to make some beeswax impregnated fabric for covering/protecting food. I ordered the beeswax and it took a while to come. 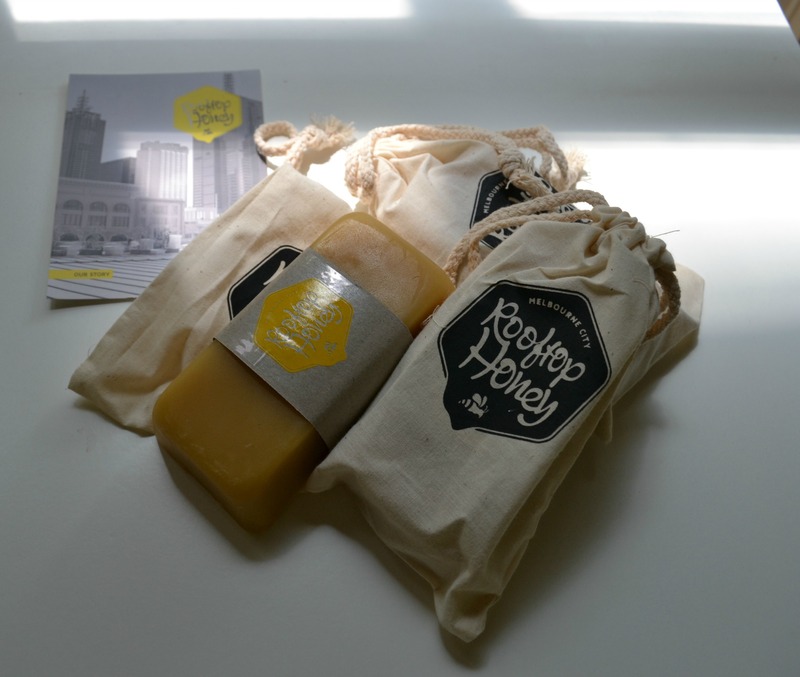 I ordered it from Rooftop Honey, a project that has bee hives on the tops of city buildings, in an attempt to increase the global population of bees. You can read about it here if you are interested. It is a great scheme. I also ordered some honey which was collected just streets away from where I live. And it is totally delish. The wax is beautiful. Hopefully, I will be able to report next month that I have actually have got around to using it. 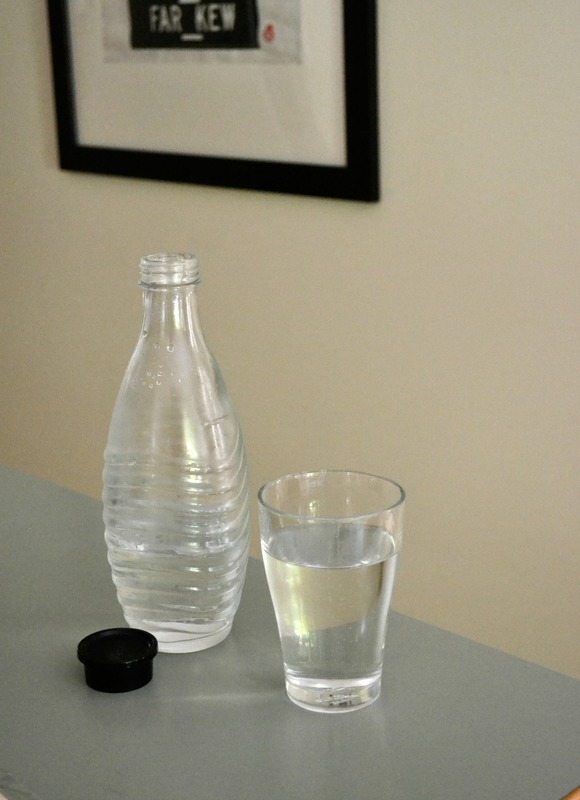 We love fizzy water in this house but have found it goes against the grain to buy it. All that plastic. And if you buy it in glass it is so expensive. I have had it in mind to buy a Soda Stream since I heard that you could buy glass bottles. In January Soda Stream offered the glass bottles at half price and the machine that uses them at a greatly reduced price. We bought one and now we can have ‘green’ fizzy water when ever we like. Yah! We had Christmas in our little house in the country and used a gum tree in a pot as our festive tree. On New Year’s Day, with great ceremony we planted it out into the ‘garden’. The last photo was taken towards the end of the month and shows lots of new growth on the little tree. 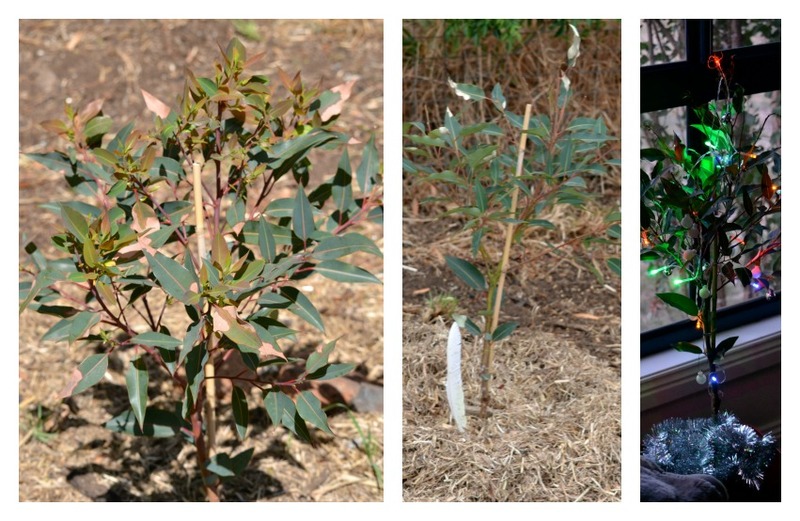 It will be a compact gum tree (2m x 2m) with lovely red flowers and ornamental gum nuts. I will enjoy watching it grow. I am eagerly watching and waiting for peaches to ripen. 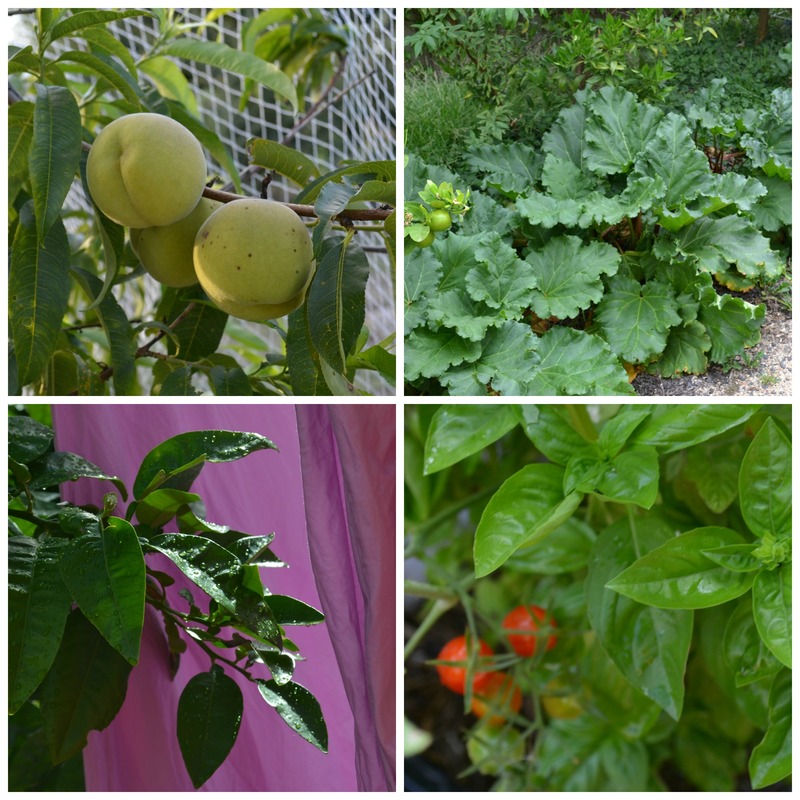 Lettuces, basil and tomatoes have been much enjoyed. Rhubarb is looking good and ready to pick. The citrus trees all have fruit forming on them. Kale, spinach and chard have grown apace and will soon be ready for eating. I need to plant more lettuce seedlings. I notice that some lettuce has gone to seed so should make sure I save some before it all blows away to chance its luck on where the wind takes it. 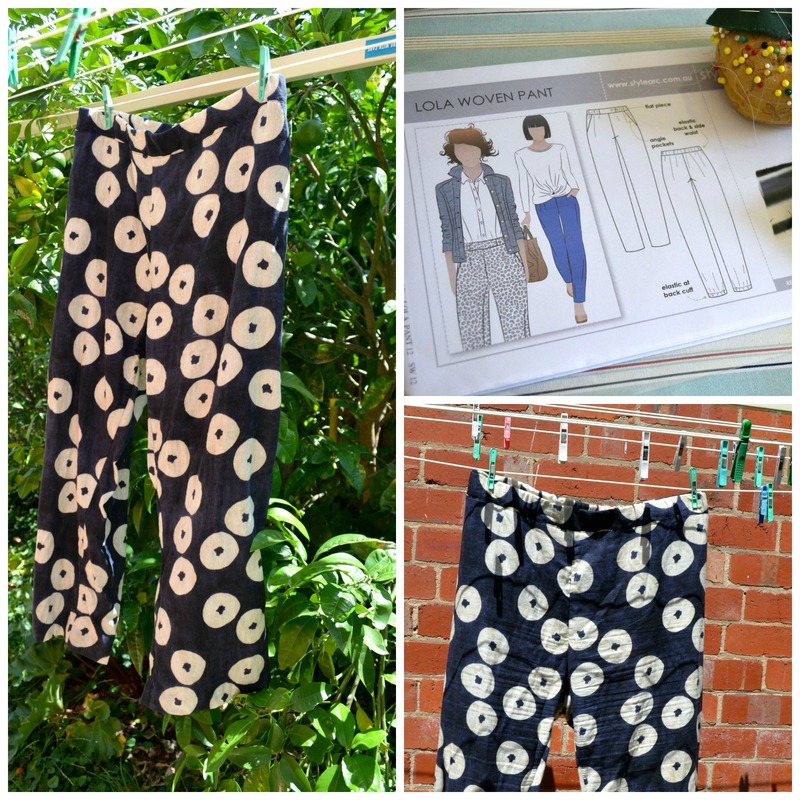 I made the Style Arc Lola pants out of lovely soft, cool, cotton double gauze fabric. These are the. most. comfortable. pants. ever (that can be worn in public). I love them. 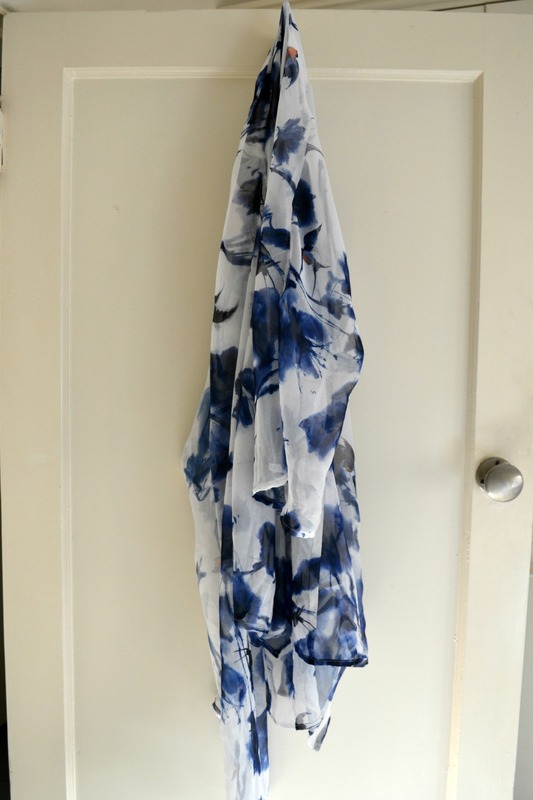 The fabric is designed by Tomotake for Japanese company Kokka and comes from a range titled “Muddy Works” . It has been in my stash for a couple of years because I really couldnt decide what to make out of it. I wasnt sure I would like pants with such a large print. But who woulda guessed it – I do! 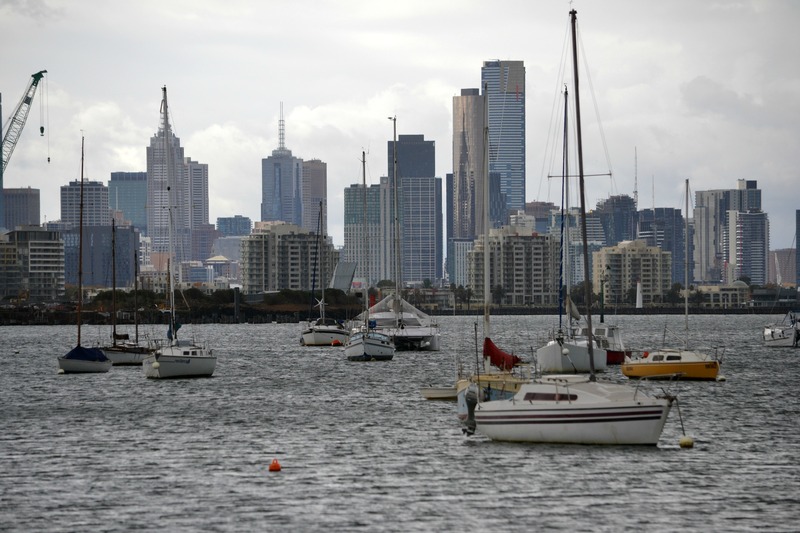 I lived most of my life in South Australia. Not surprising then, I am drawn by some sort of nostalgia to all things that bring back happy memories of the place. That must have been what attracted me to this book. 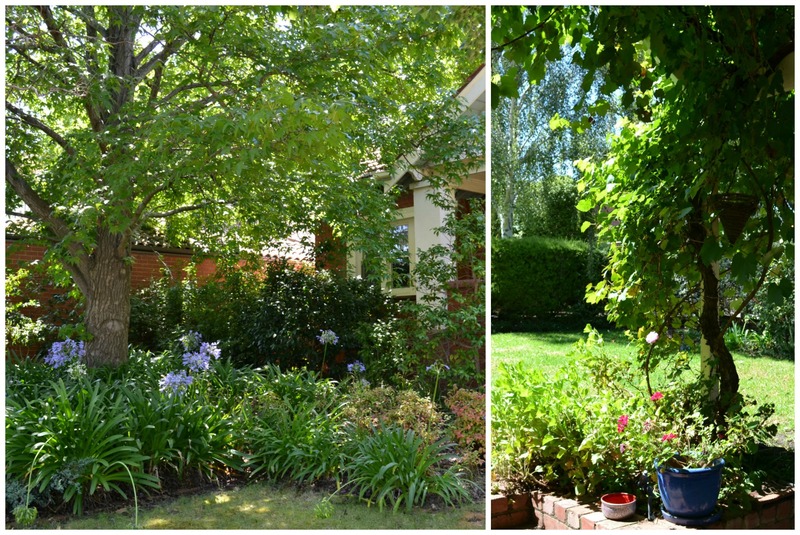 It is a journal of a woman in her 70’s establishing a garden in Adelaide. I couldnt have predicted how much I was going to love this book. I learnt so much about gardening, plants, chickens that it wouldnt have mattered where the book was set. 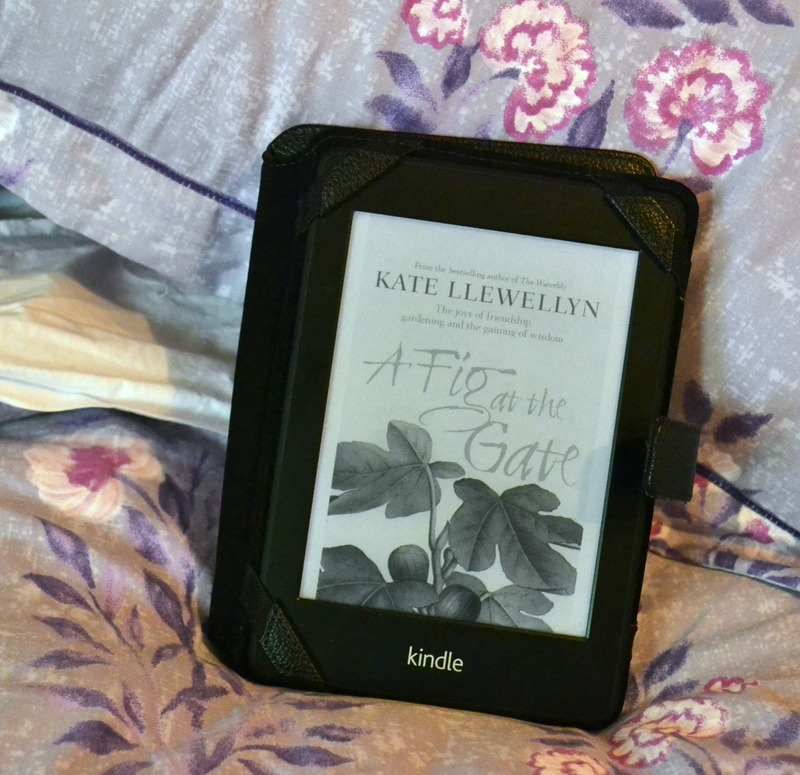 I am looking forward to reading some more of Kate Llewellyn’s gardening journals. By chance I discovered that Kate was going to be speaking at my local library in March. I rushed home and booked a ticket when i found that out. I have made a commitment to read (at least) 12 books by Australian writers this year, so this is the first. 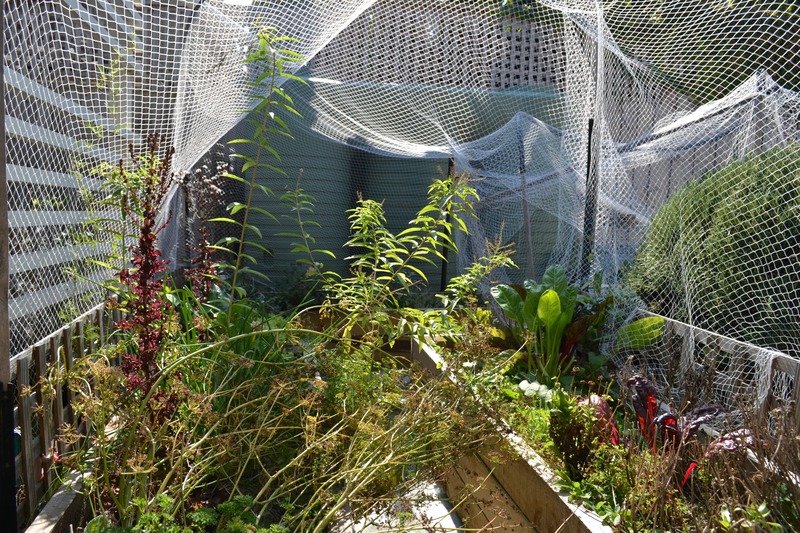 This month I have enjoyed our shady city garden and I have enjoyed planning our country garden. It will definitely be more edible than ornamental, in contrast to our city garden, which I did not plant. I have enjoyed a meal with special friends going through a really hard time. I have enjoyed watching the second series of “The Fall” and the first series of “Rectify” I like the pace of January and wish it could be the same for the rest of the year (but then I wouldnt notice and appreciate it, I suppose). I hope your January was just as you would have liked it to be. What a lovely month December was! Three weeks holiday helped to make it so and gave the opportunity to think about the monthly nine away from my city home and garden. On the last Friday in November we collected the keys to our little house in the country and camped in it that weekend. Then on the second weekend in December we returned, on holidays, and with plans to make the little house homely. 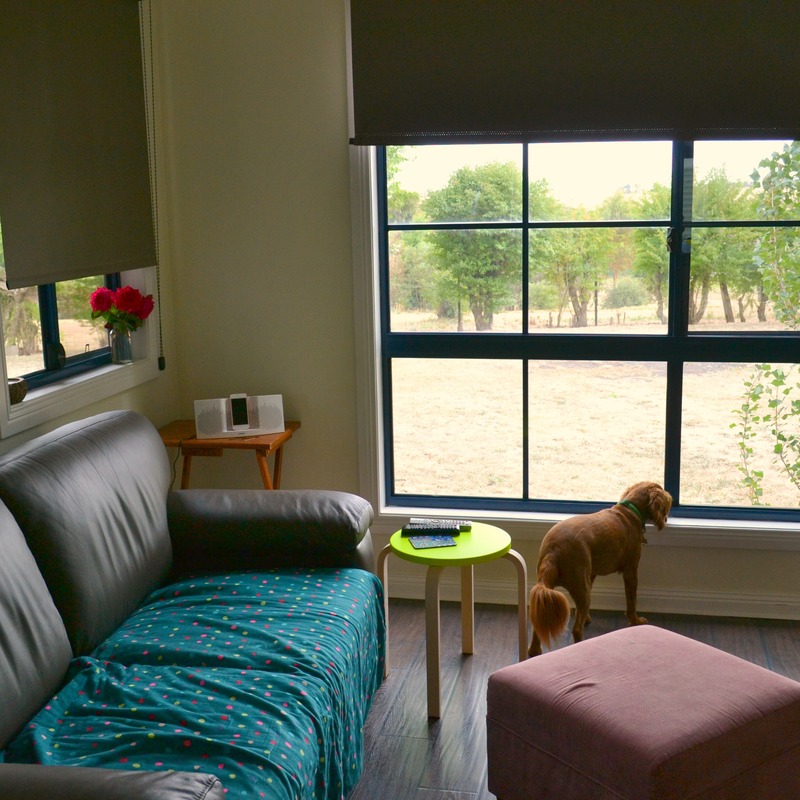 While we had numerous trips back to Melbourne to catch up with friends and family over the Christmas period we accomplished much and loved being in our little house. So, to recap on December, I am joining in with Linda and others here. Almost everyday while we were on holiday we ate mango, blueberries, yoghurt, nuts and seeds for lunch. It was delectable. 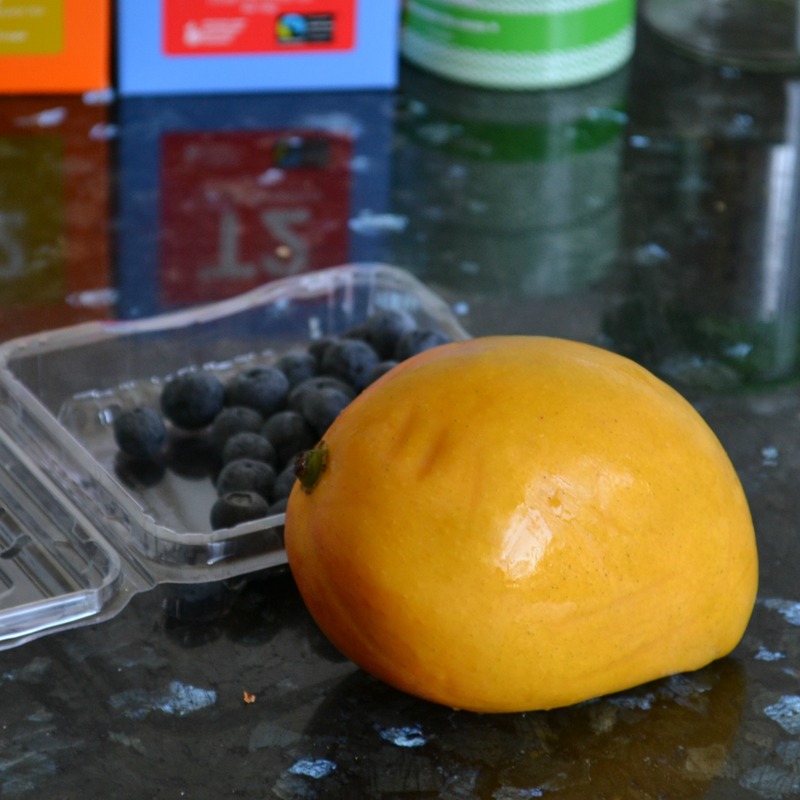 I have never been fond of mangoes, so I am surprised how much I am enjoying them this season. Perhaps it is a particularly good year for mangoes? Anyway, I have also used them in a few different salads and am enjoying the taste and aroma of fresh mango. Of course, you would expect that a round up of December would include Christmas fare but the truth is, I didnt eat any of the traditional Christmas foods – apart from cassata, which is a tradition from my childhood – an icecream dessert for the kids who didnt like plum pudding. I still make it each year. Fresh prawns were a treat enjoyed in the park with family. Each time we returned to the city for an event, and went home, I picked lettuce leaves from my garden to take back to the country house. Sometimes there were ripe tomatoes as well but they are really only beginning to ripen now. 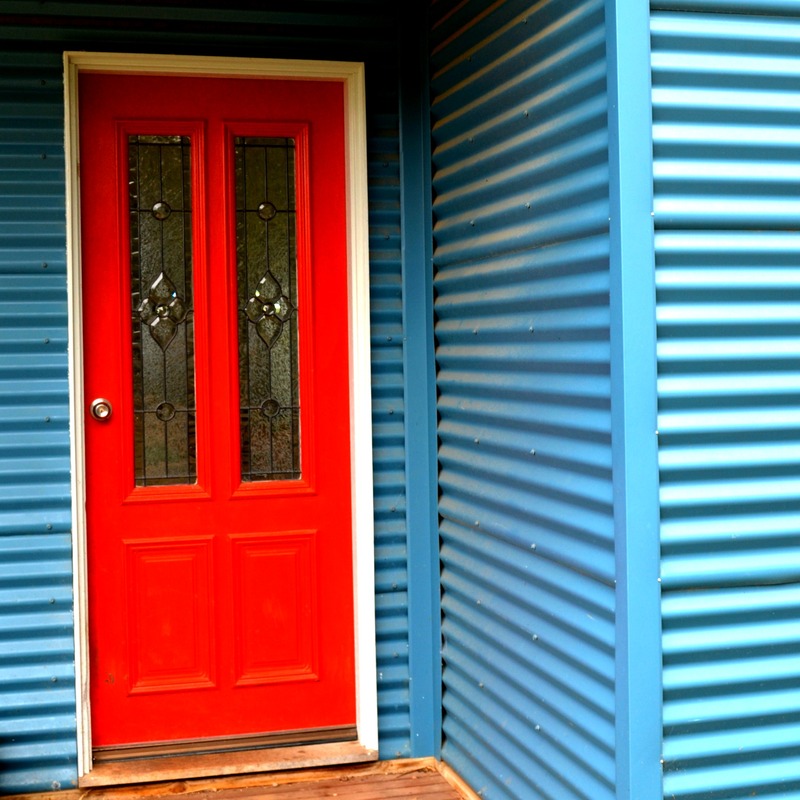 One day we plan to live in our little house in the country, so the three weeks that we were there felt like we were making inroads into a dream we have held for quite a while – that it was really going to become an eventuality. We spent the time, in a sense, preparing for our future, both near (when it will be a weekender) and distant (when we will live in it permanently). There has been lots of talk (and dreaming) and a little research into what we could and can do with this house. We washed windows and scrubbed the stove, bought a fridge, added some furniture and some window dressings. The house is not very energy efficient so that will be one of our first priorities. Weeds, undergrowth, dead plants/grass were all removed from the yard. It took a few weeks to do and it filled up this massive bin. There are still plants that need to be removed from the block – hawthorn bushes in particular. The motivation for clearing away undergrowth was to remove any hiding places for snakes. We know they are around, and would hate our inquisitive little dog to get bitten. I did some research into a solar powered vibrating thing that is supposed to keep snakes away but after watching a youtube video of a snake catcher demonstrating that it didnt work, I figured I would save my money and do the best we could to make the yard less desirable to snakes. 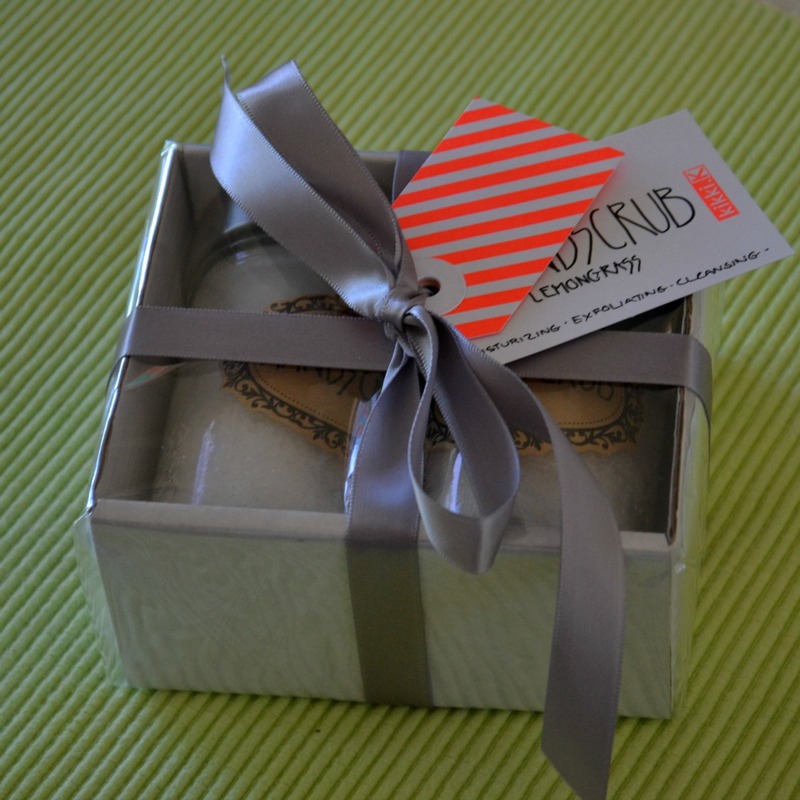 This month I made sugar scrub from white sugar, coconut oil and essential oil. Really simple. I love the exfoliating, moisturizing effect it has and how good my skin feels after using it. I have been expecting ants to come and enjoy it too but so far they havent. Hopefully the essential oil deters them. I decided to put scrub into attractive containers and give it to all our neighbours for Christmas. I hope they will like using it. 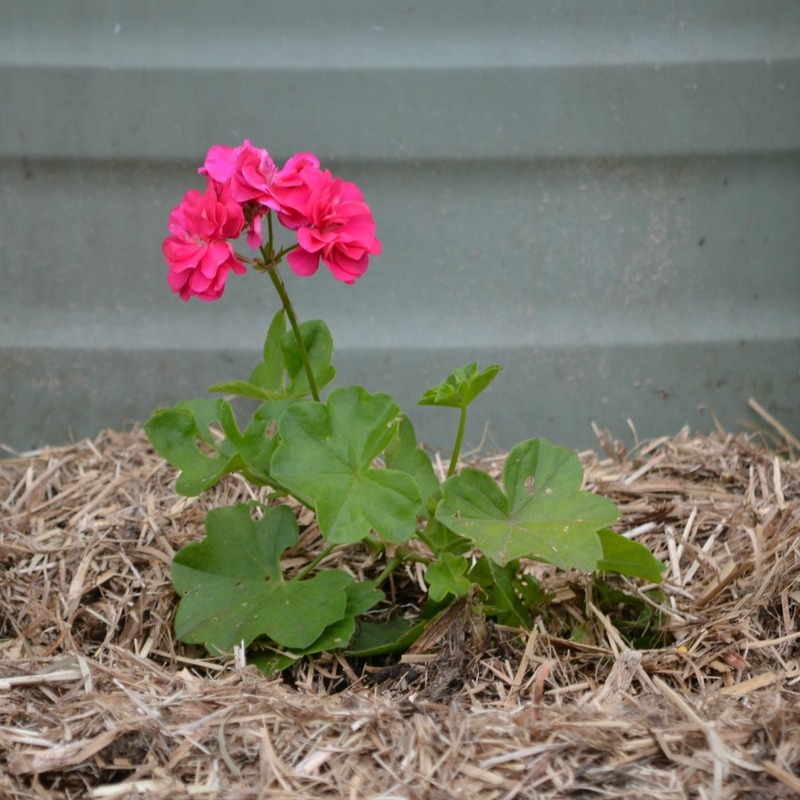 I propagated a number of Pelargoniums several months ago and planted these to provide a spot of colour. Also, once an elderly woman with an amazing garden told me that she used Pelargoniums to make soil more friable and conducive for other plants. 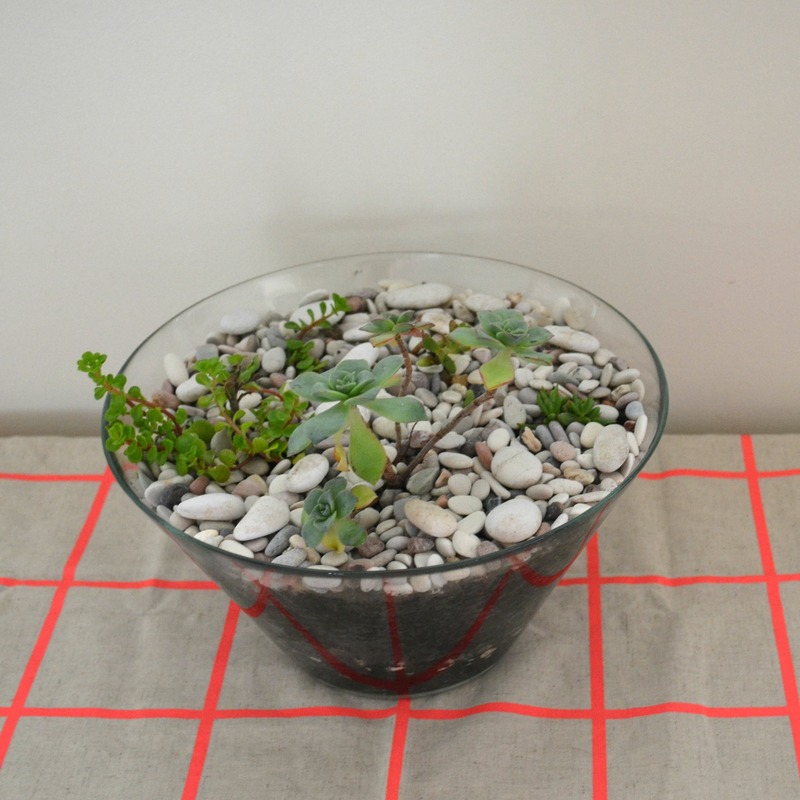 These hardy plants send their roots down into the hard soil. Once they were well grown they are removed and a more desirable plant is put in their place. My challenge is to find plants that will grow without attention, or watering, since I dont live there to nurture anything. 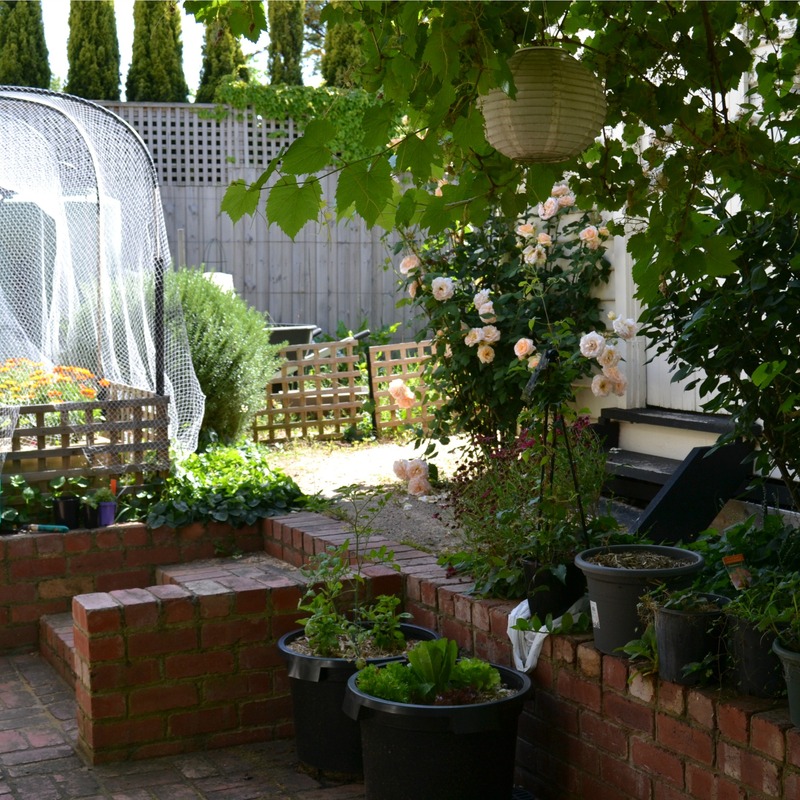 Later this year we will plant some species that are indigenous to the area, which should grow well unattended but when I actually live in this house I want to have a lot of the garden providing food. I guess there might be some fruit trees that will grow without much attention. I am thinking a fig tree, at the very least. But perhaps even these need nurturing while they are young? Inside the house I have a sword fern in a self watering pot and lots of succulents. 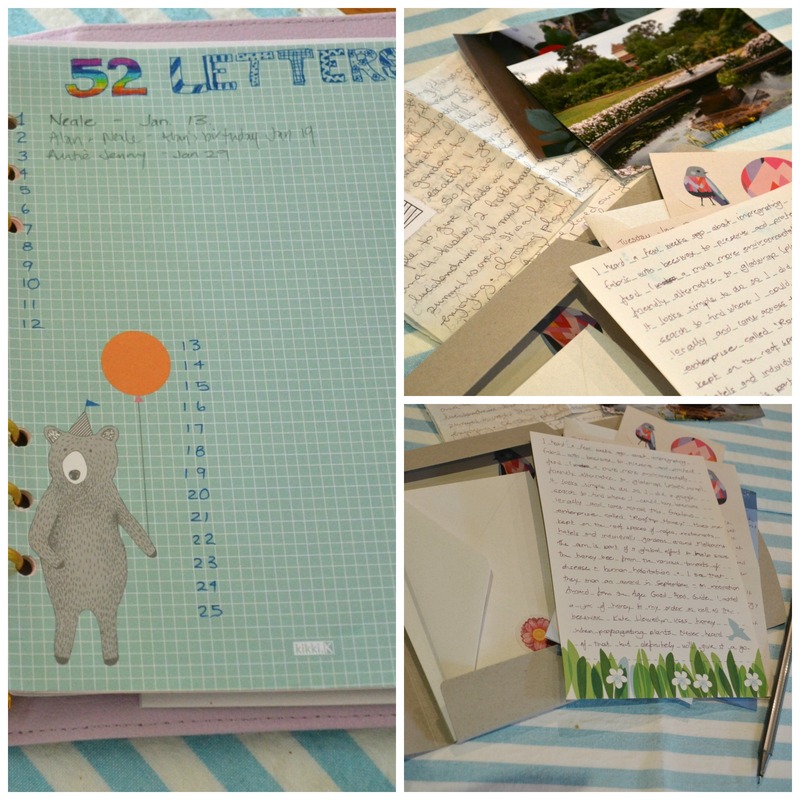 This month my creating has gone mostly gone into making things for the house, though I did sew up some undies for myself – but I’m not showing you them! I made a cover for the sofa from beautiful dotty Nani Iro fabric. I hand stitched linen fabric into serviettes at night time while watching TV. 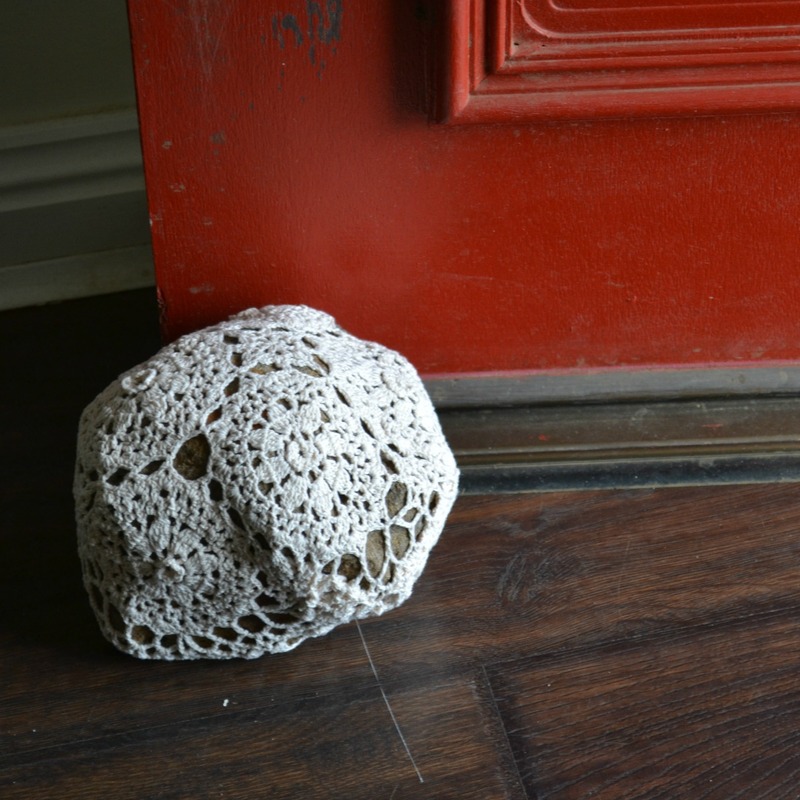 I made placemats and covered a stone with a crocheted doiley for a doorstop. In December I read My Year Without Matches by Claire Dunn. I couldnt wait to go to bed each night to discover more of what this amazing woman was up to. While there were physical challenges ( building a shelter, making fire, finding food) , it was the emotional journey Claire made that interested me most. 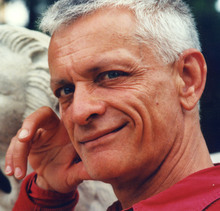 Who are we without all the external structures that shape our lives and frequently define us? How do we connect with our inner wisdom in a way that it guides and sustains? I loved reading about Claire’s crafty pursuits and how satisfying it was to tan hide to make clothes, to weave grass baskets and make clay eating utensils. I was awed by her bravery – walking around barefoot in the dark. 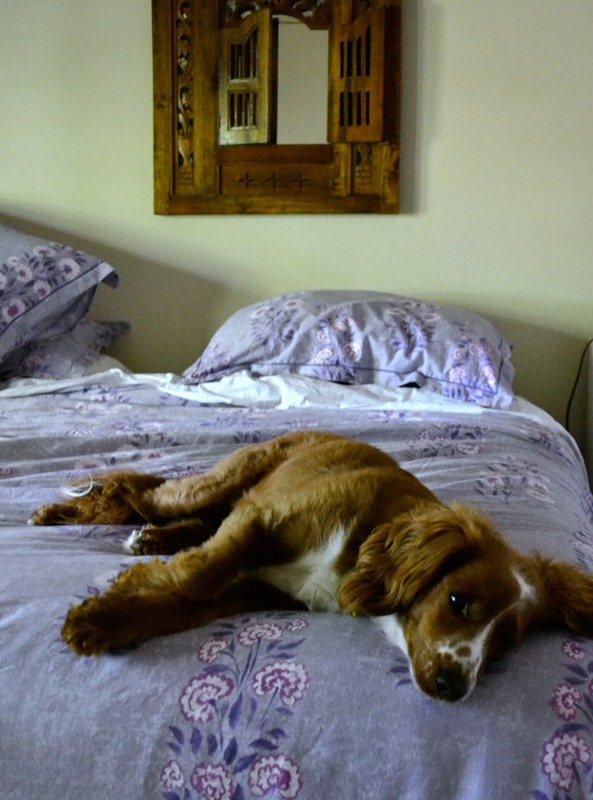 One night she woke during a nightmare to find a red bellied black snake poking and prodding the mosquito net she was inside. Since reading the book, I have found myself much more observant of the sounds that birds make. I bought an IKEA doll and had a lot of fun making her a skirt, jacket, necklace and head scarf. She came wearing a t-shirt and undies. 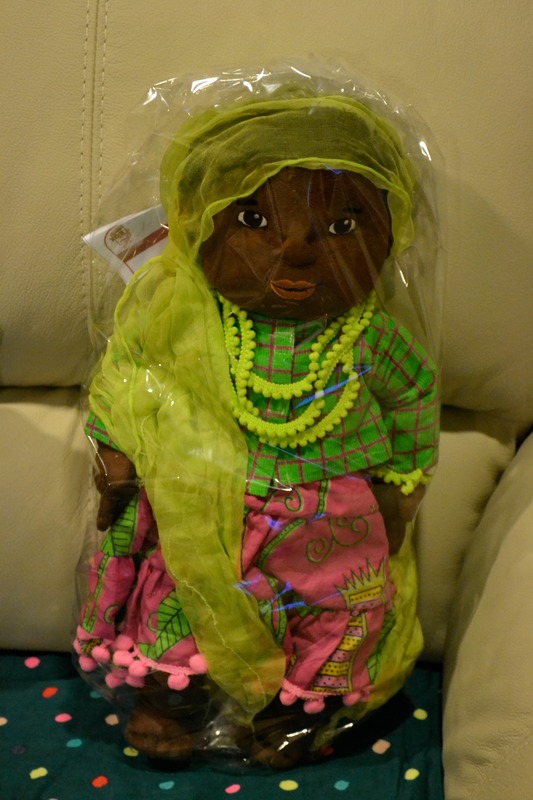 Here she is wrapped in cellophane, ready to be put under the Asylum Seeker Welcome Centre Christmas tree. 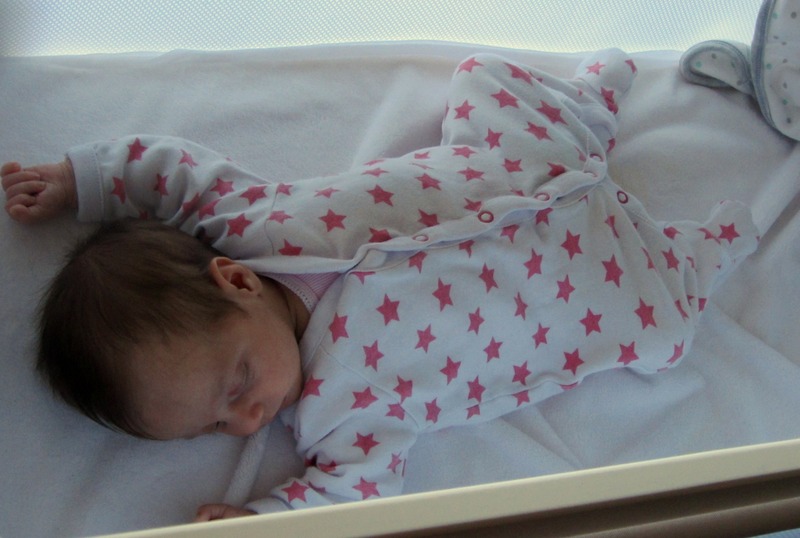 I didnt think to take a photo before she was wrapped up, which was a bit of a pity. I hope some little girl is enjoying playing with her. So much was enjoyed this month. Meals with friends and family. Morning walks. Satisfaction of tasks accomplished. One highlight was catching up with movies I had wanted to see when they were at the cinema and are now on DVD. The best two were Locke and Reaching for the Moon, but I also enjoyed Calvary, All is Lost, Begin Again (fabulous soundtrack! ), The grand Budapest Hotel, Still Life, A Most Wanted Man and Kill Your Darlings. The BBC TV series The Honourable Woman was also definitely a highlight. Here it is almost mid December but I do want to record some things about November. For the second month in a row I am pleased to be joining in with Linda from Greenhaven with the Slow Living Monthly Nine, begun by Christine in 2012. I’m really glad to have these categories, like goals, in my mind each month, even when I dont quite fulfill them. This salad was enjoyed at least once a week in November. 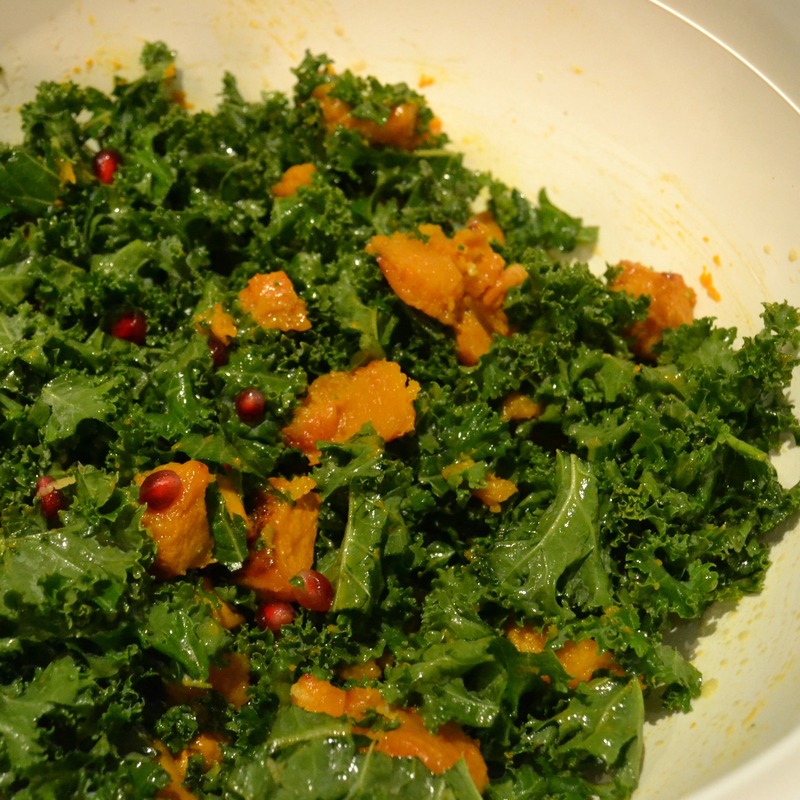 It is made of roast pumpkin, kale and pomegranate and has a dressing of 3T olive oil, 1T apple cider vinegar, 1 T maple syrup and 1 T Dijon mustard. We enjoyed freshly squeezed orange juice most mornings. And poached eggs many mornings. Our breakfast used to be yoghurt, berries and seeds but once it dawned on me that this was very portable we started taking it for lunch. Then I experimented and made lots of different things for breakfast. Some more successful than others but I’ve got a bit boring, as poached eggs are so quick, easy and delicious. I’m still trying to improve oven baked sweet potato chips for Friday night ‘Fish and Chips’. They usually taste good but I’d love to be able to get them nice and crispy. On the last Friday in November we collected the keys to our little house in the country and then spent the weekend ‘camping’ in it. 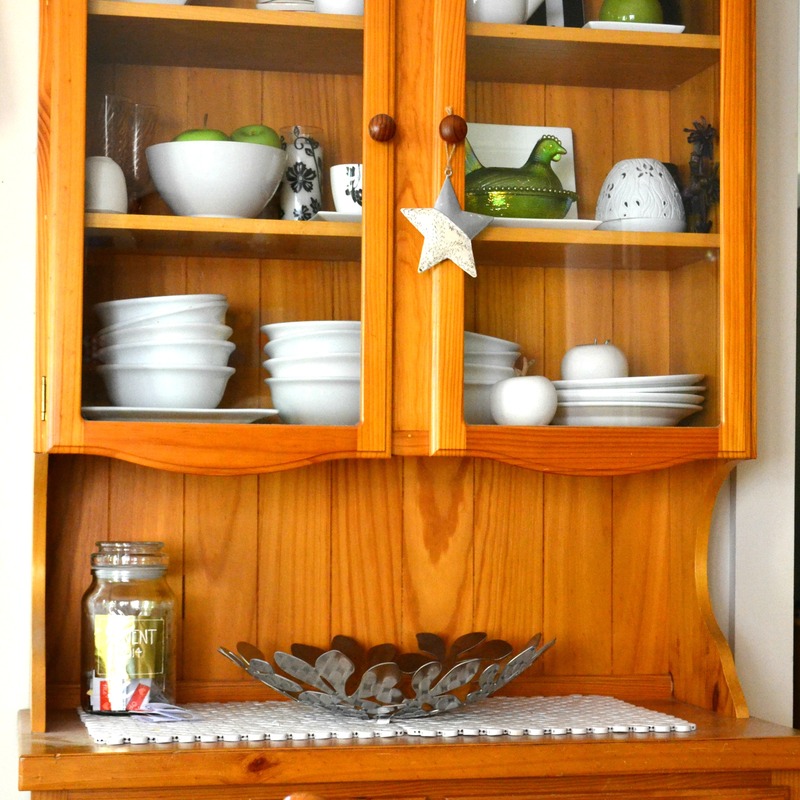 Throughout the month I collected cutlery and crockery and other bits and pieces for the house. I also had all of my Christmas present shopping completed before the end of the month. Probably meant I missed all the pre-Christmas sales. Never mind, it was a lot more fun taking time to plan and purchase. 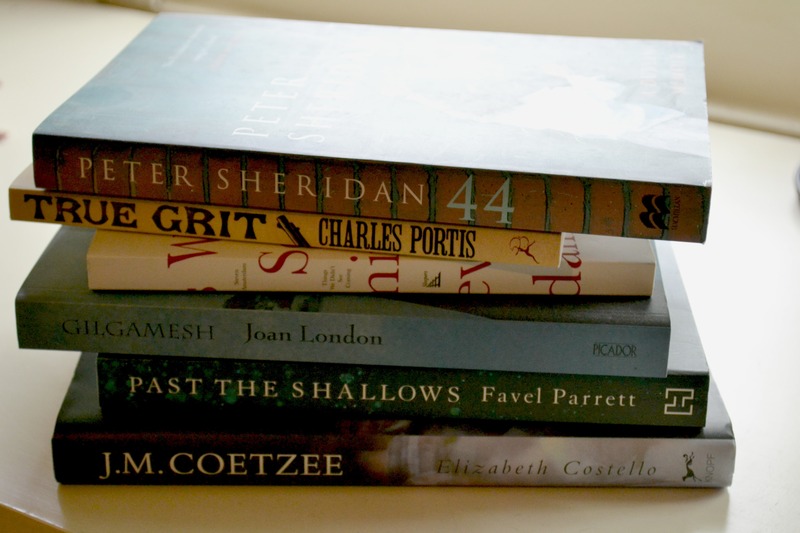 Just a browse of my bookshelves to gather a pile I’ve read and can now donate to the op shop. Had sprouts on the go most of the month. It has been years since I did this. Quinoa was the first I tried. And this was a disaster. 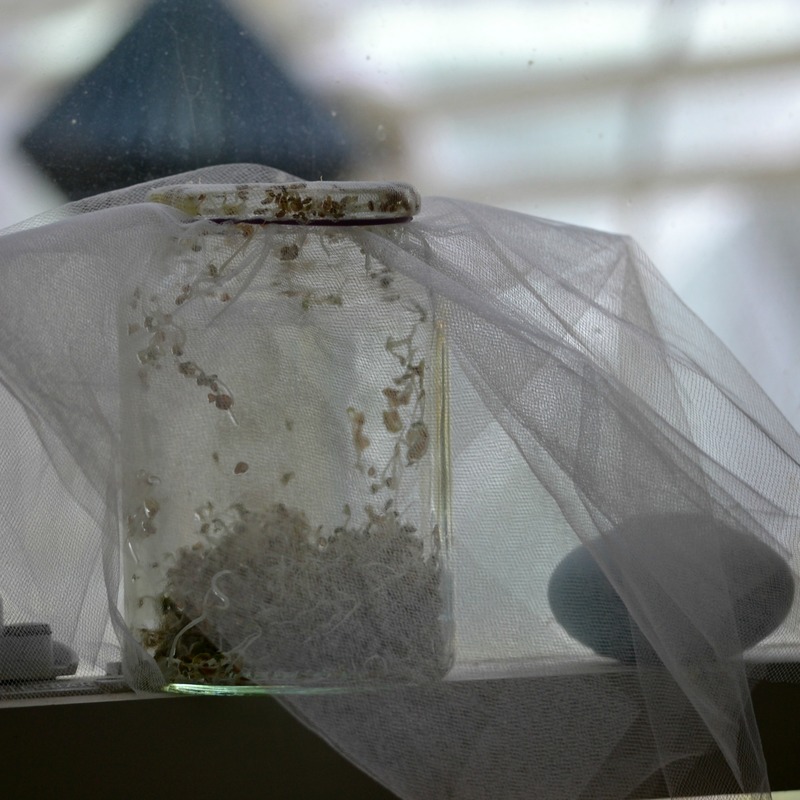 I havent tried them again but I think my mistake was leaving them uncovered – exposed to light in the first few days. I watched a few youtube videos and then used alfalfa and chickpea seeds. These have all been successful. The warmer weather meant that the seeds grew quickly. So, I am confident to give quinoa another go. 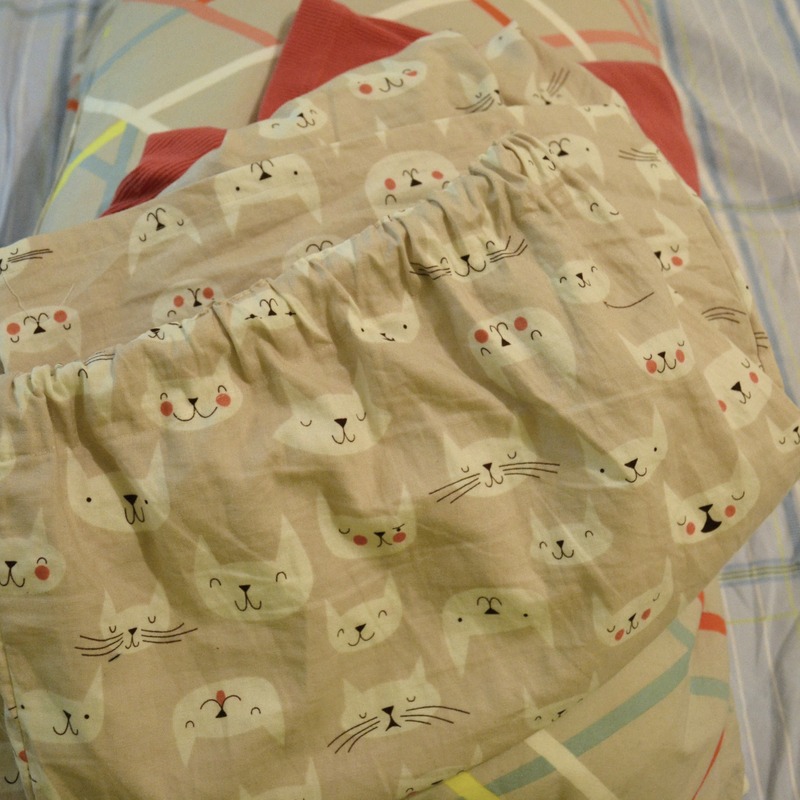 This month I made the ‘cat’s pyjamas’ for me. I couldnt resist the cute fabric. It is quilting cotton and has made lovely cool pj bottoms. Also this month I made a dress, top and gathered shorts for a little girl’s first birthday. Didnt think to take any photos before I wrapped them up and gave them away. 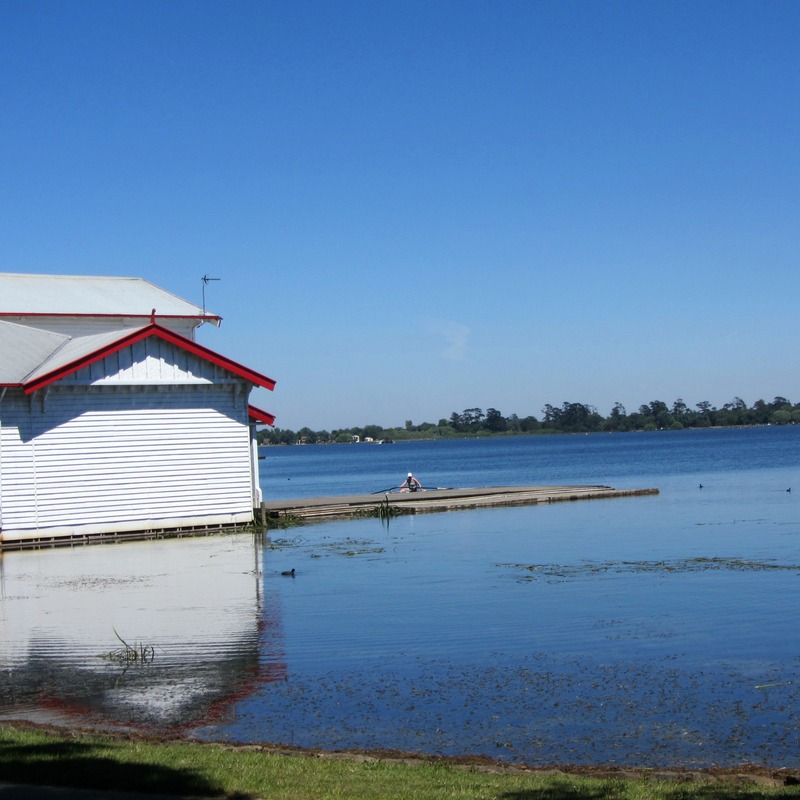 I ‘discovered’ Lake Wendouree. Circumstance meant that I had a morning to fill in at Ballarat. I have only ever driven through here on my way somewhere else and had never been to the Lake. Billie (the dog) LOVED it! Although I couldnt let her off, the extending lead allowed her to swim, paddle and put the wind up a few ducks. Not the swans though. I saw one giving Billie the eye. She saw it too and knew to leave well enough alone. It was a beautiful end of spring day and we spent a very pleasant few hours strolling around the lake, taking a rest under trees every now and then to consider ‘the state of the world’. 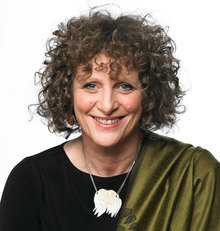 That’s the other amazing thing The Wheeler Centre does – not just have fascinating conversations with writers, which are often free but then sometimes, makes that conversation available to watch. I had been unable to attend the evening when the Chaser’s Julian Morrow interviewed David Walsh (of MONA fame) I was surprised and so so delighted to find it online. I have watched this three times now and will probably do so a few more times yet. 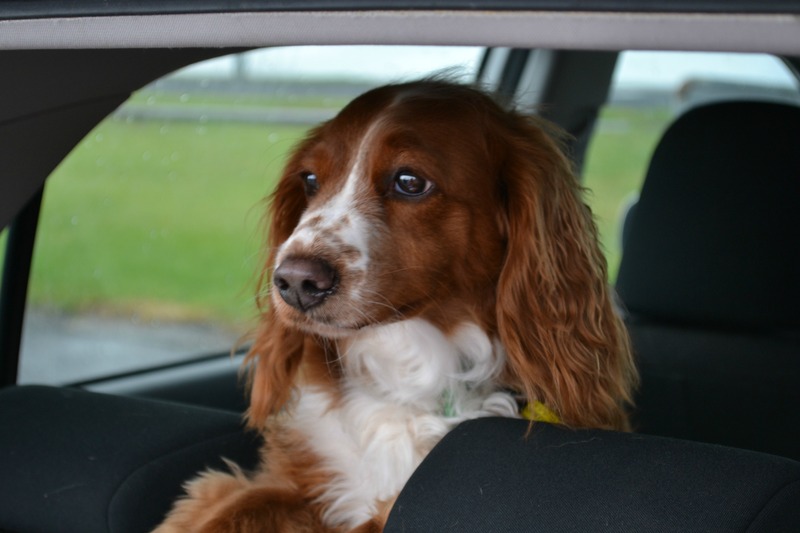 David is amazing – quirky and totally non-conformist. I am amazed and fascinated by him, inspired too. There is a lot of uncommon wisdom in what he has to say. I really like listening to the way he makes sense of the world and i love his uncertainty – or at least acknowledging that he frequently ‘changes his mind’. That video is here. Alice Waters, of the Slow Food Movement fame, was another video I enjoyed this month. I know this category is really about how we, ourselves might contribute to and enhance the community around us. I am disappointed to say that I cant think of any ways I have done that this month. A goal for next month? 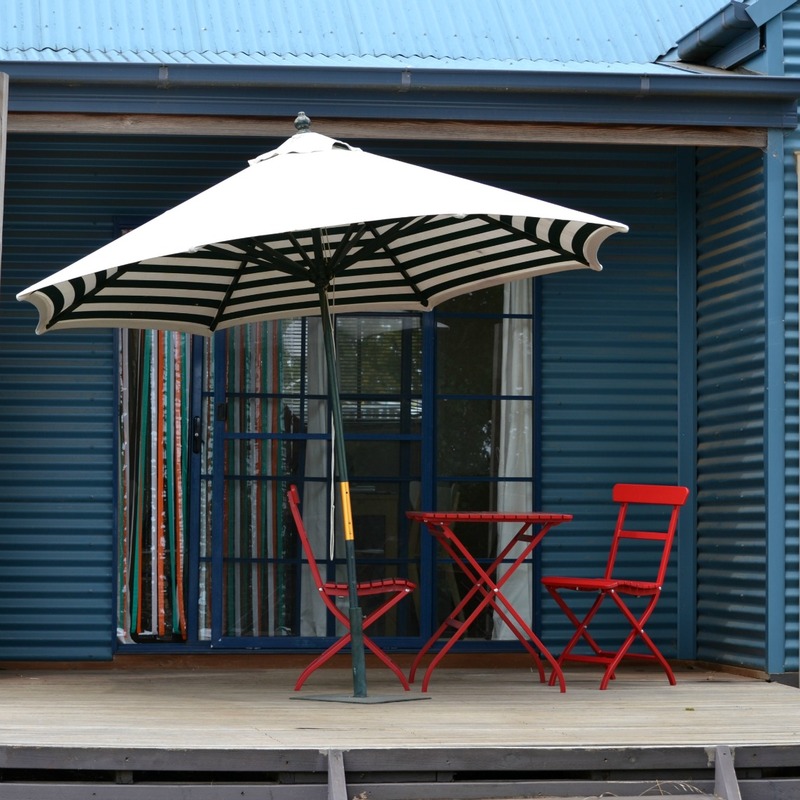 A lovely long weekend early in November was spent at Harrietville. The village was so pretty, with spring flowers in abundance. Particularly Rhododendrons. 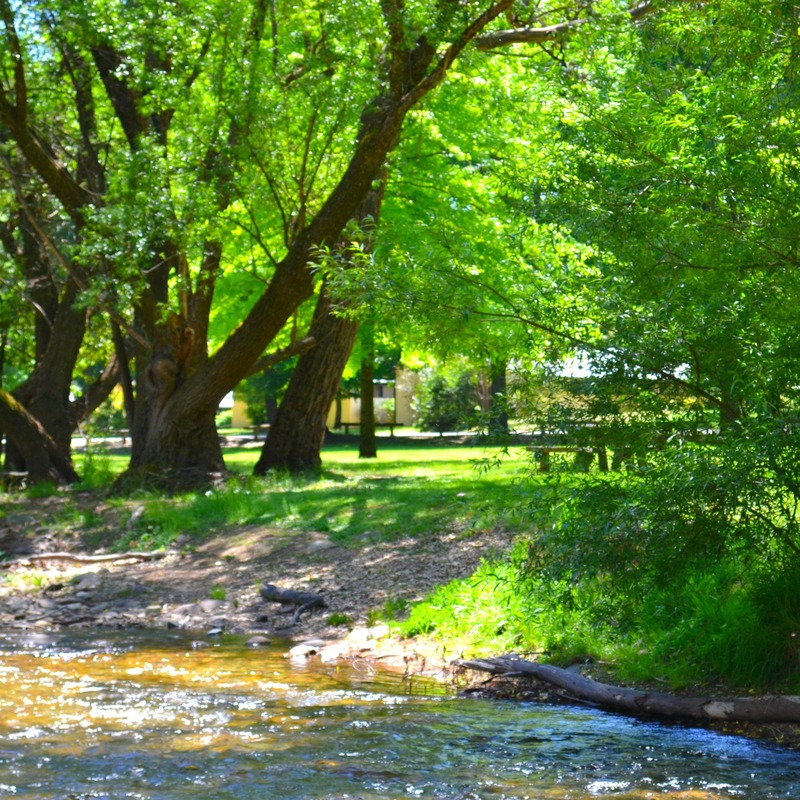 The Ovens River was sparkling and the shady trees inviting. I sewed, walked, read and watched the whole of the second series of House of Cards. Totally indulgent. I did cook some delicious healthy meals, as well. Zucchini pasta, gluten free pizza, among others. I also had a lovely day catching up with a friend in the city. We had Bing Boy (Urban Asian street food) for lunch. 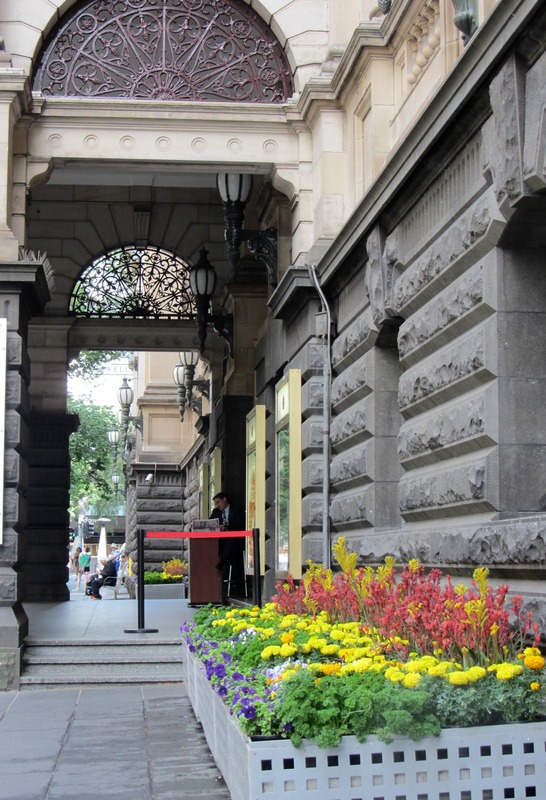 Notice the parsley growing in the flower boxes near the Melbourne Town Hall, along with Kangaroo Paw and marigolds. Fabulous! There is no doubt that Christmas is a lot more fun when there are kids around but this does not mean that households without kids should miss out on any of the fun. No siree! 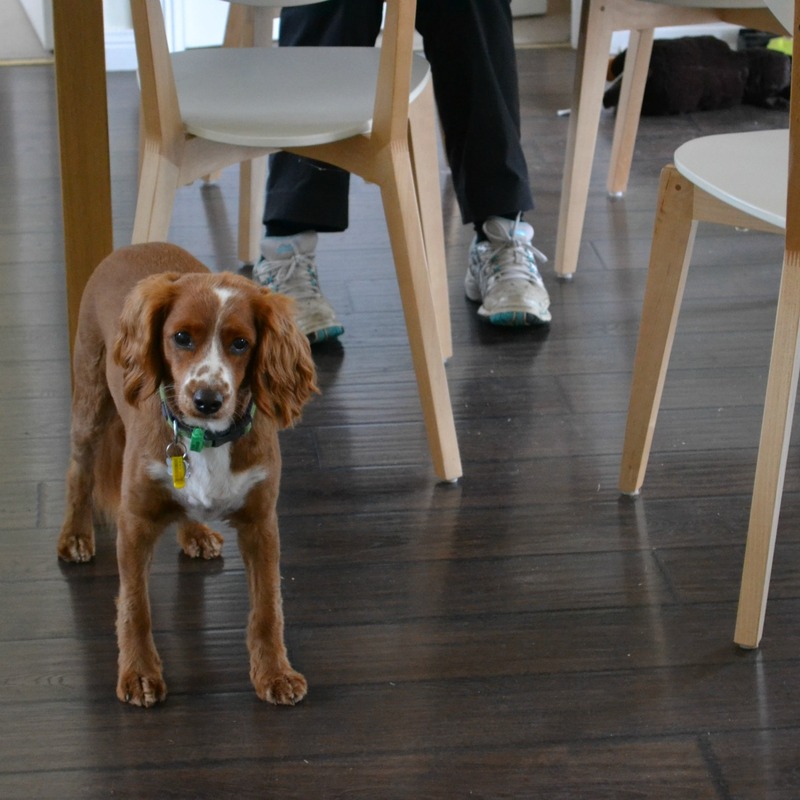 In our household we have two adults and a dog. And it is Christmas everyday for the dog. A couple of years ago we were hosting the extended family Christmas Day get together and there was lots to do and plan and a measure of excitement and anticipation. To countdown we made a list of things that needed to be done, things we wanted to get done, and things that would be fun to do so that we could enjoy counting down the days and not have a “last minute rush” to get it all done. 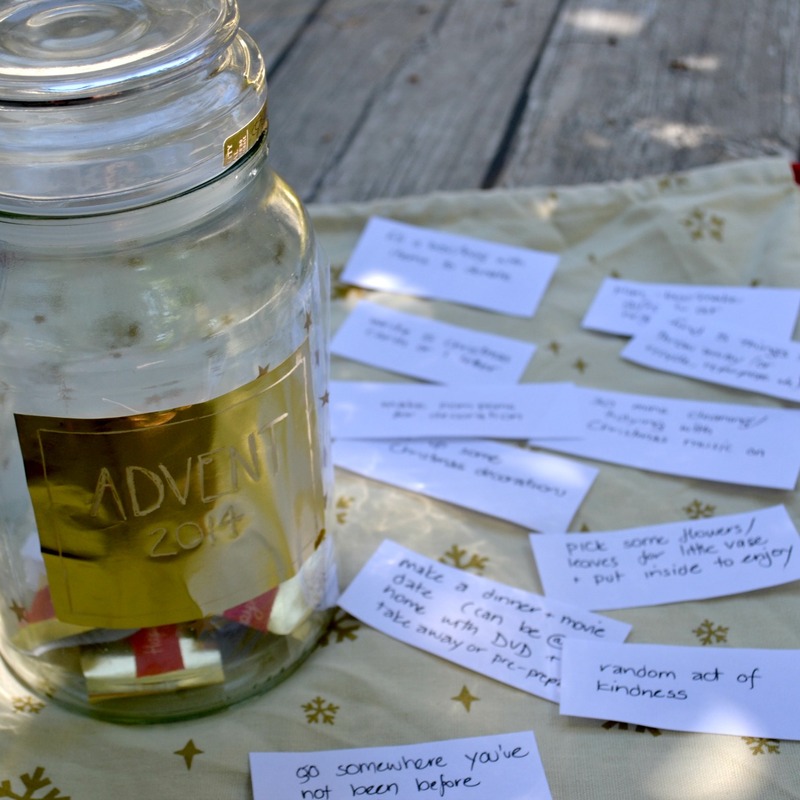 The list was cut up into single activities. 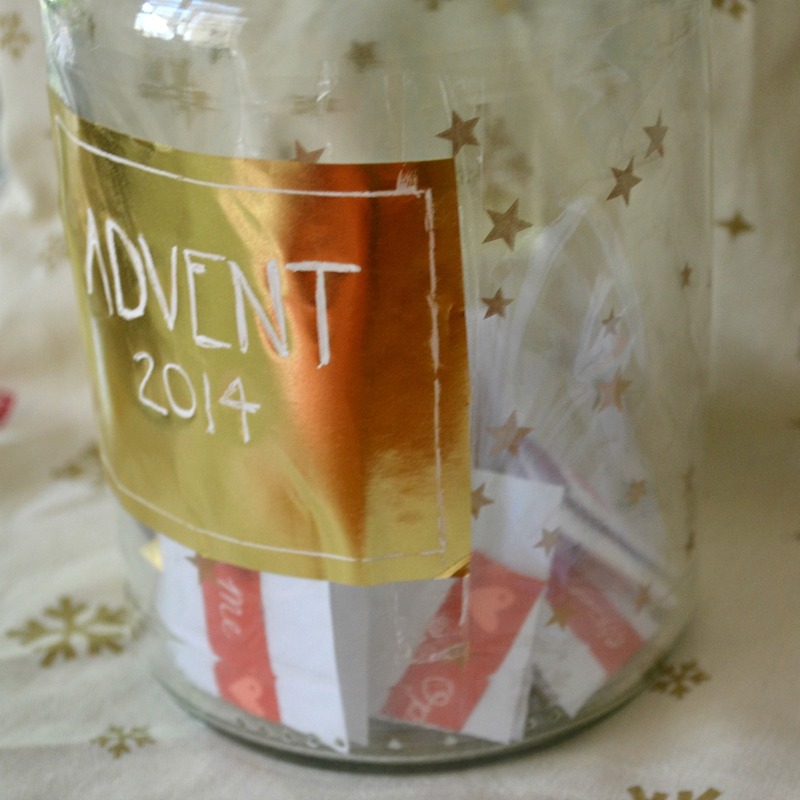 Folded and placed in a jar. Each morning at breakfast we took out a piece of paper and made plans to achieve the task. Most activities were done at night time – things like ’30 minutes of cleaning while listening to Christmas music’ or ‘write 5 Christmas cards’ or ‘put up some decorations’ but there were also some things that needed to be done during the day when we were out – things like ‘perform a random act of kindness for a stranger today’. Other things we would agree on a plan to achieve – things like ‘watch a feel good movie’. 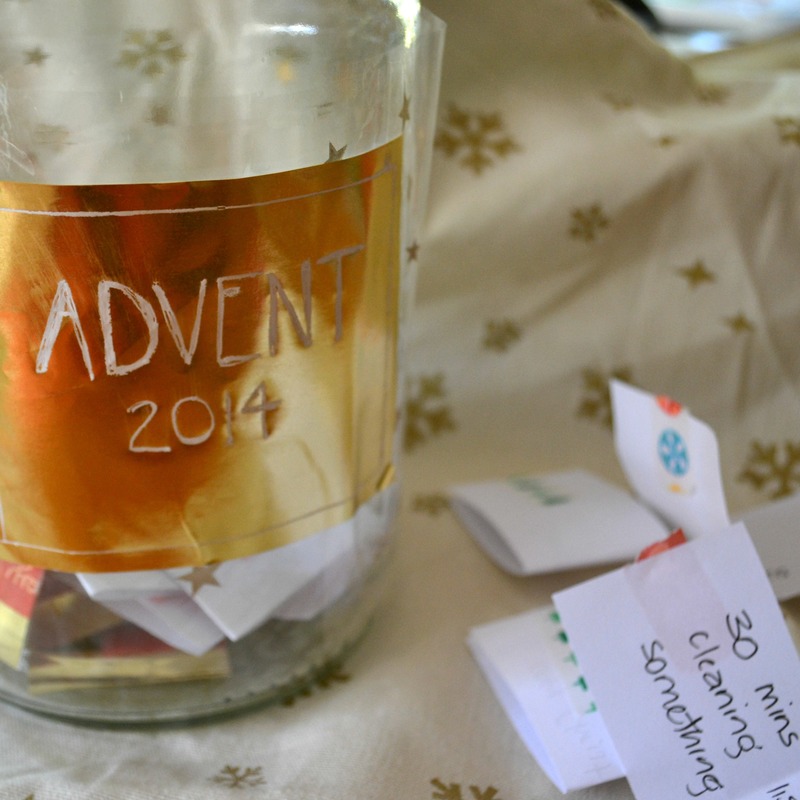 The Advent Jar has become a Christmas tradition for us. This year I am home by myself for the first week. Then we will be away for the third and fourth week but home for Christmas Eve. So the first weeks pieces of paper have been sealed with white background washi tape and contain activities that I myself want to do before Christmas. Like ‘make some lemon scented sugar hand scrub’ and ‘sew some Christmas pillowcases’ (to sleep on – not fill with presents!) The second and third weeks activities are sealed with red tape. These activities will be suitable for which ever place we are in. 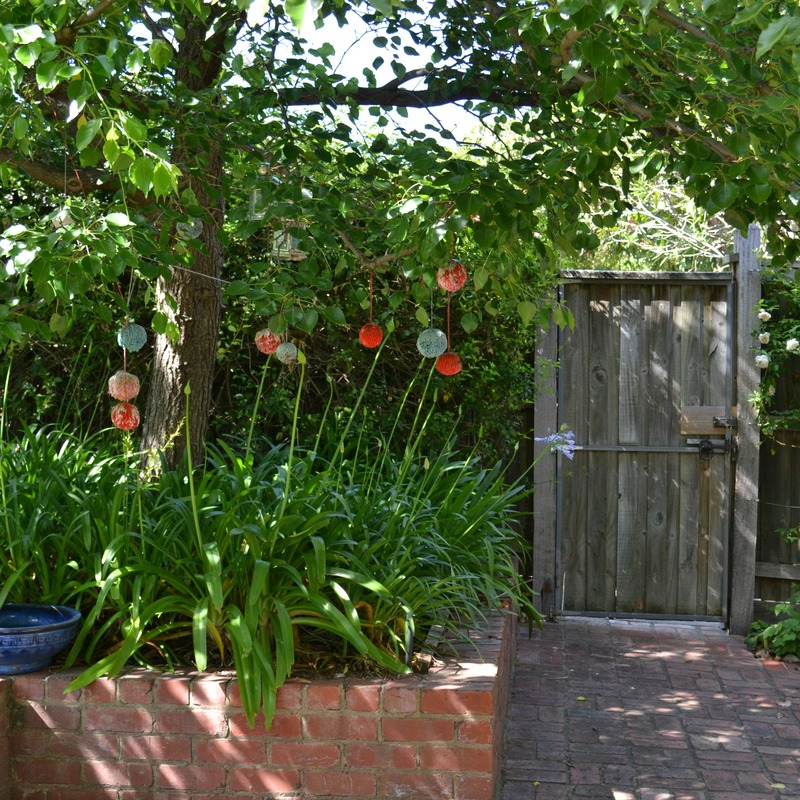 One of the activities during this time is to make some pom poms to decorate trees outside. I will just need to remember to take some yarn when we go away. I know we will find some trees to hang our pom poms on wherever we are. The activities for the last week are written on gold paper, so we know to leave these until last. Not much point getting a ticket with ‘write five Christmas cards’ just the day before Christmas. Hopefully cards would all be done by then. So the gold pieces of paper have things for close to Christmas. Like ‘wrap some presents’, ‘go out to see the Christmas lights in the neighbourhood’. 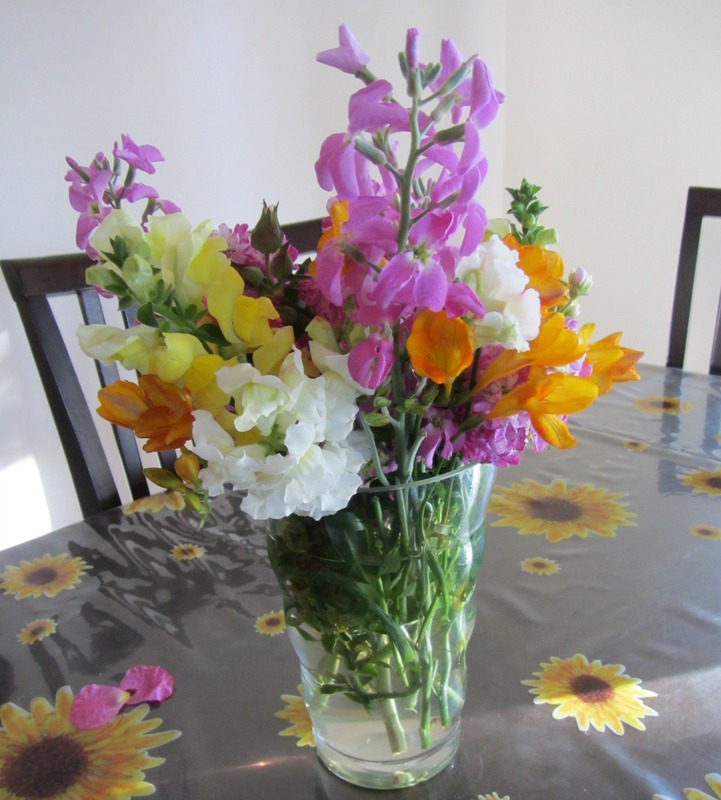 The activity I am most looking forward to getting is ‘go out into the garden and pick some flowers/leaves to make a little arrangement, arrange in a vase and place somewhere in the house where it will be enjoyed’ . We will both do this separately. 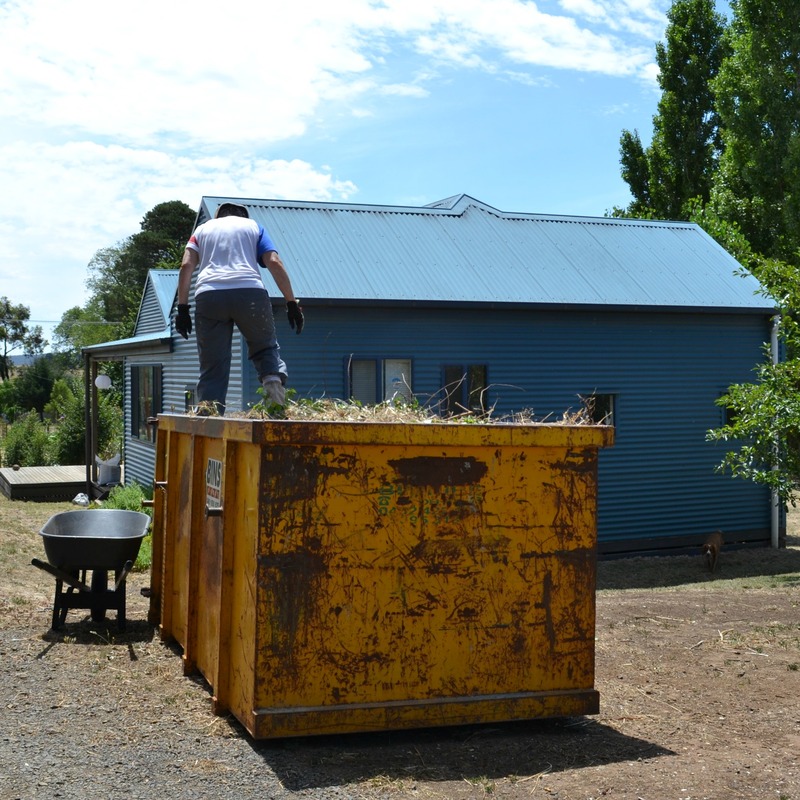 There are some activities that we will do together – like ‘plan what little gift to buy or make to give to our neighbours’, there are others that each of us will do on our own, like ‘find five things to donate to the op shop’. 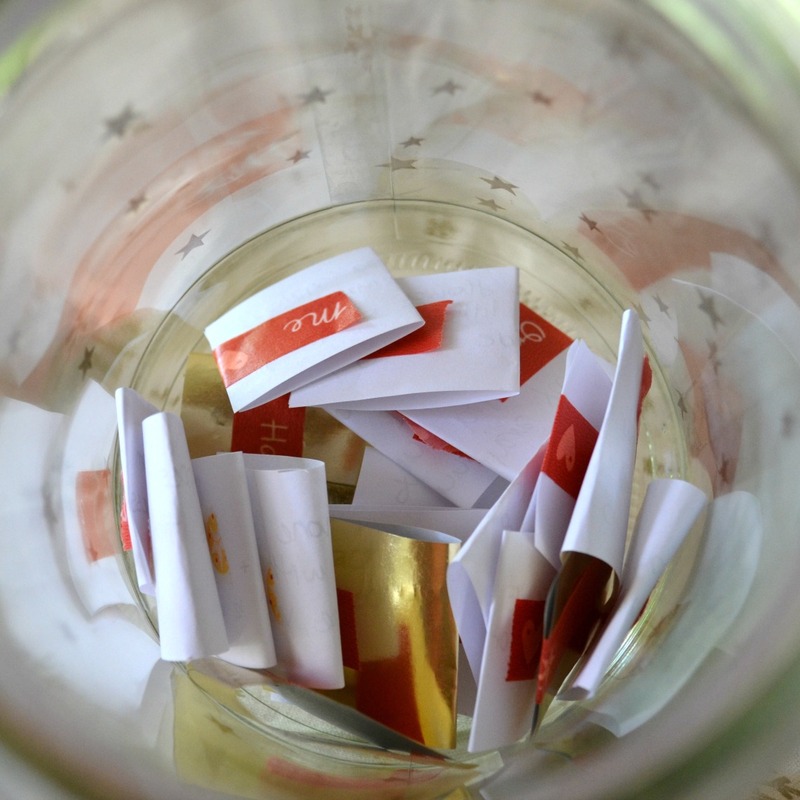 Then there are some that we might do together or we might do on our own – like ‘make a donation to charity’ or ‘go somewhere you’ve never been before’, perhaps depending on the day that activity gets drawn out of the jar. And there are some things that are not really an activity but a breakfast table conversation – such as ‘share your hopes for the Christmas/New Year period’. 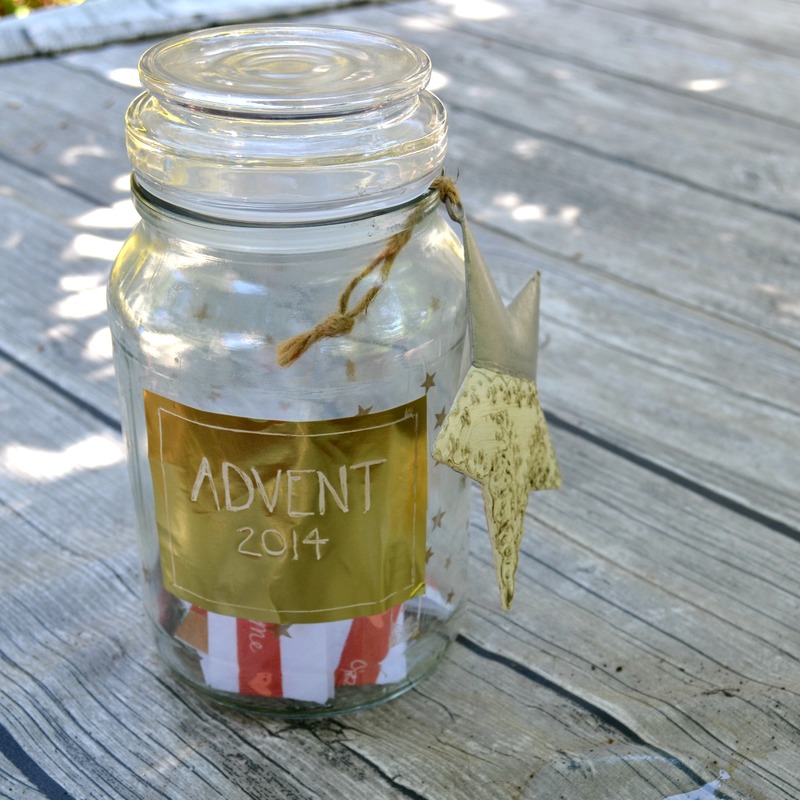 Counting down to Christmas is not just for kids – not in this house! I have been enjoying Caffe Strada gluten-free quinoa bread. This month I discovered that it makes delectable french toast, topped with raspberries and blueberries (from the freezer, heated a little) and a dollop of yoghurt. Exactly the kind of meal I’d be likely to order if I went out for brunch. 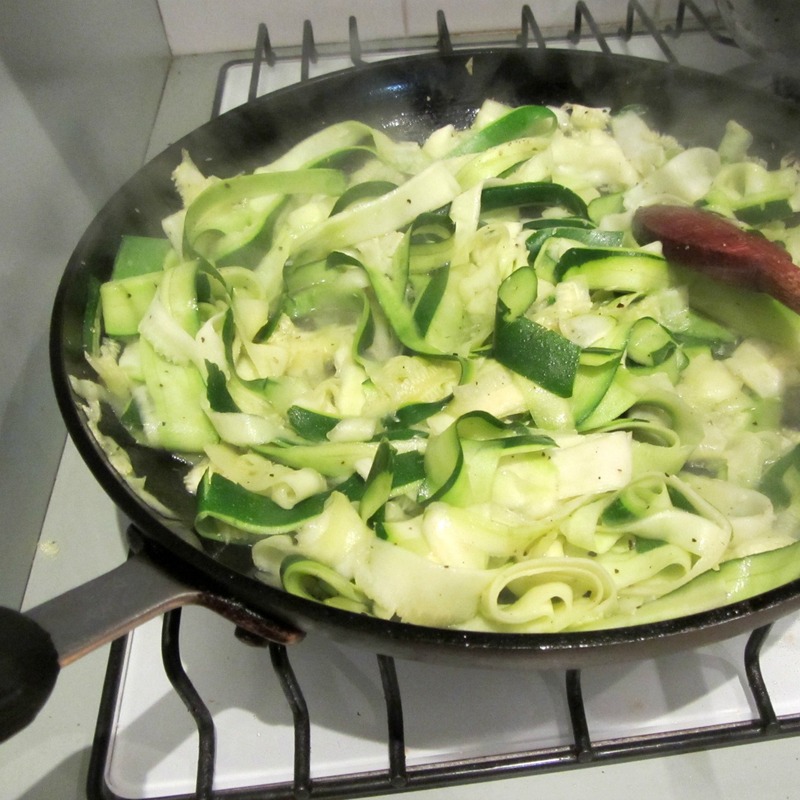 Zucchini fettuccine has also been enjoyed on quite a few nights. To make this you just use a veggie peeler and slice the zucchini into thin strips, then heat a little ghee in a pan, stir the zucchini until it softens, season with pepper and sea salt and serve with any form of pasta sauce. Also this month I discovered my local green grocer selling Kombucha. I have wondered what this tasted like. I love it so think it would be worth investigating making my own. We really enjoy haloumi cheese in this household. Keeping a 200gm block in the fridge (it can have a super long time in the future use by date) is a great standby to make a substantial meal. A slice grilled adds the wow factor to roasted vegetables, served in an attractive stack with a dollop of plum sauce. But the best, yummiest, quickest meal I make out of haloumi cheese is fritters. 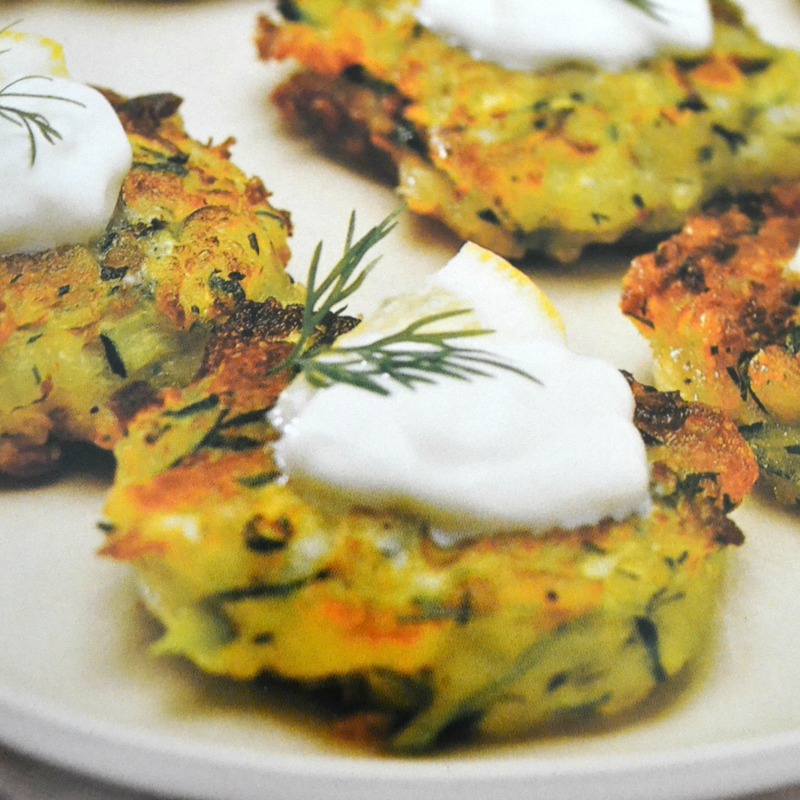 The original recipe was for zucchini and haloumi fritters but using just about any green vegetable chopped up works well. I’ve tried parsley and basil (together), spinach, silverbeet and kale. form fritters using heaped spoonfuls of the mixture and cook in batches – about 2 minutes each side or until golden and firm. Drain on crumpled paper towel. Delicious served with tomato relish and/or Greek style yoghurt. Can be eaten hot or cold. Great for breakfast, packed lunch or dinner with salad. 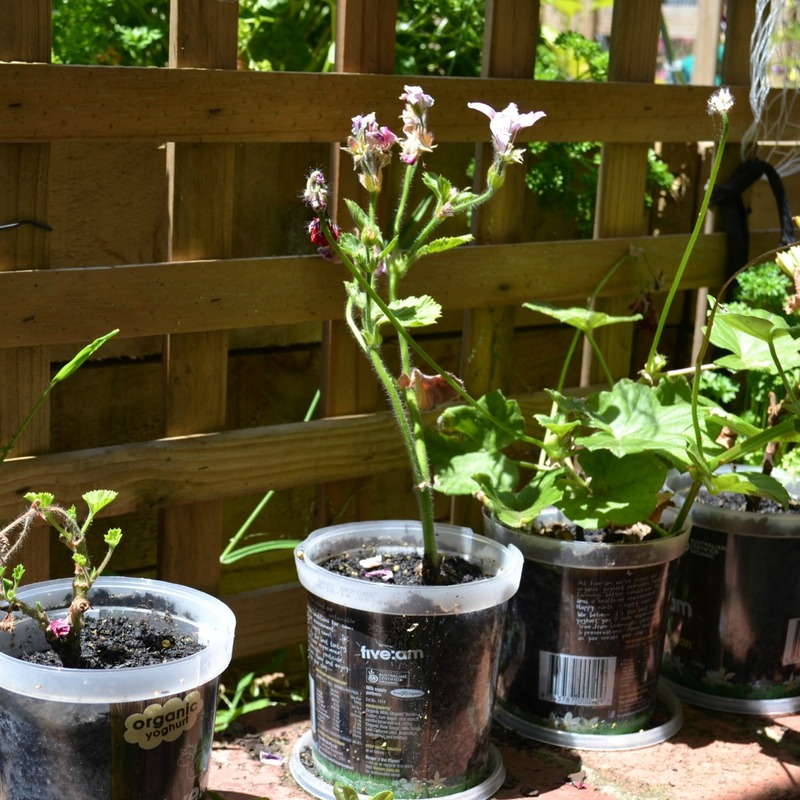 Re-using yoghurt containers as pots. Five am Organic yoghurt comes in a very sturdy plastic pot. This month I have used the pots to propagate a whole lot of Pelagonia cuttings I acquired. Drainage holes were made in the bottom, using a heated skewer. The lid is used underneath the pot as a tray. 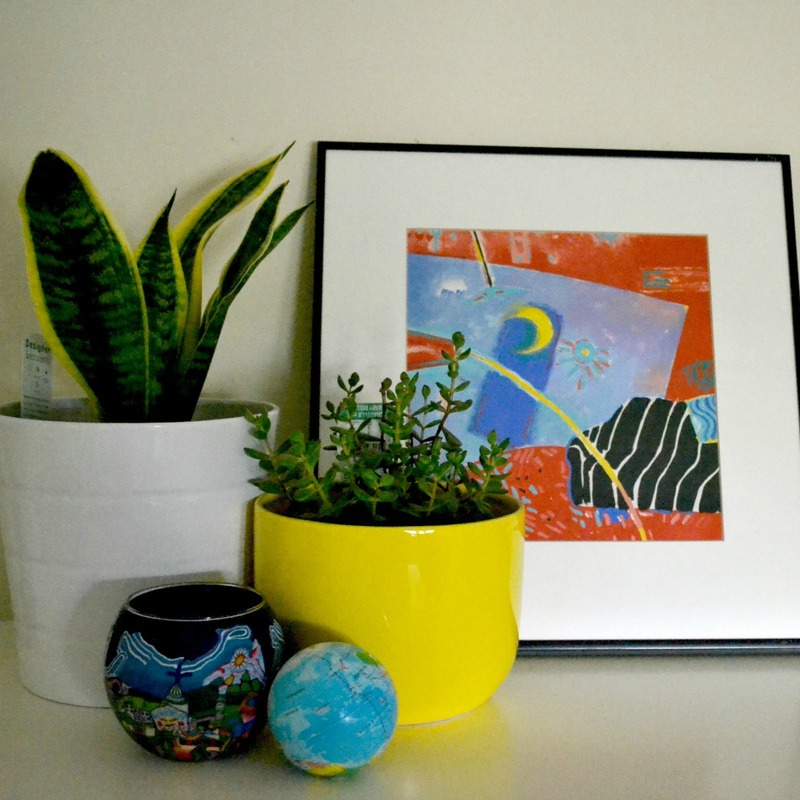 In the Australian Womankind magazine (launch issue), I was surprised to read that the good ol’ Snake plant was listed as one of the top 5 houseplants for oxygen, according to NASA scientists, and that it was particularly good to have in the bedroom because it absorbs carbon dioxide and releases oxygen during the night. They are also super hardy and virtually impossible to kill. I bought one, and a few nice pots to put other plants I’ve propagated in the bedroom. 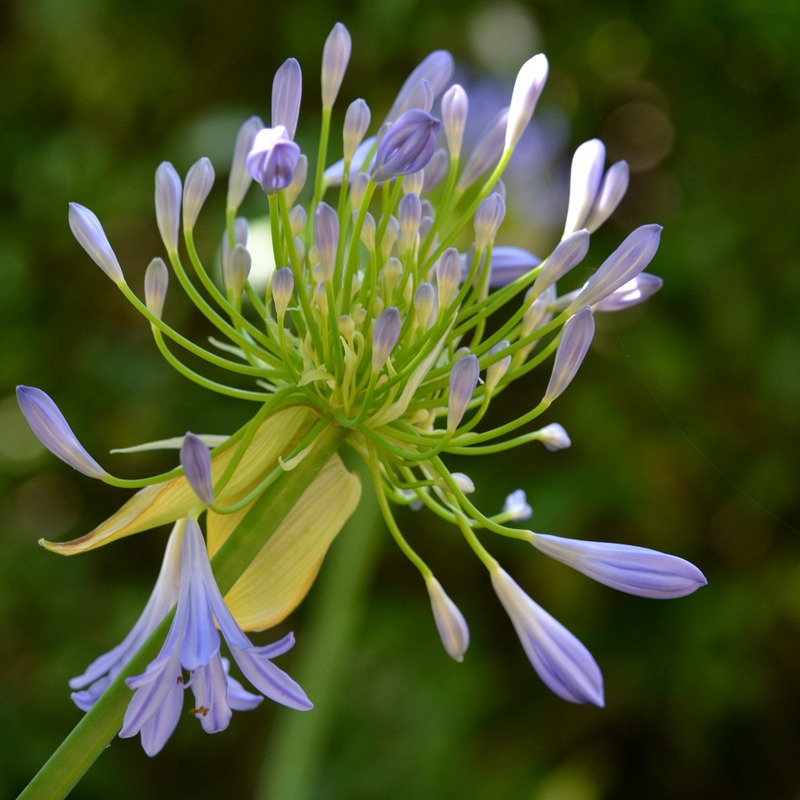 The other four on the top 5 list are Aloe plant, English Ivy, Rubber Tree and Peace Lily. October has been the month of making and wearing kimono sleeve jackets. I have made five of them. Is that excessive? No wonder I am wearing them all the time. They are just so versatile for this time of the year – I can wear long sleeved, short sleeved or no sleeved tops under them depending on the weather – and they are just so quick to make. There is a tutorial here. I made one using this method. The others have all been made using Simplicity 1884 which I have made a little longer than the pattern. 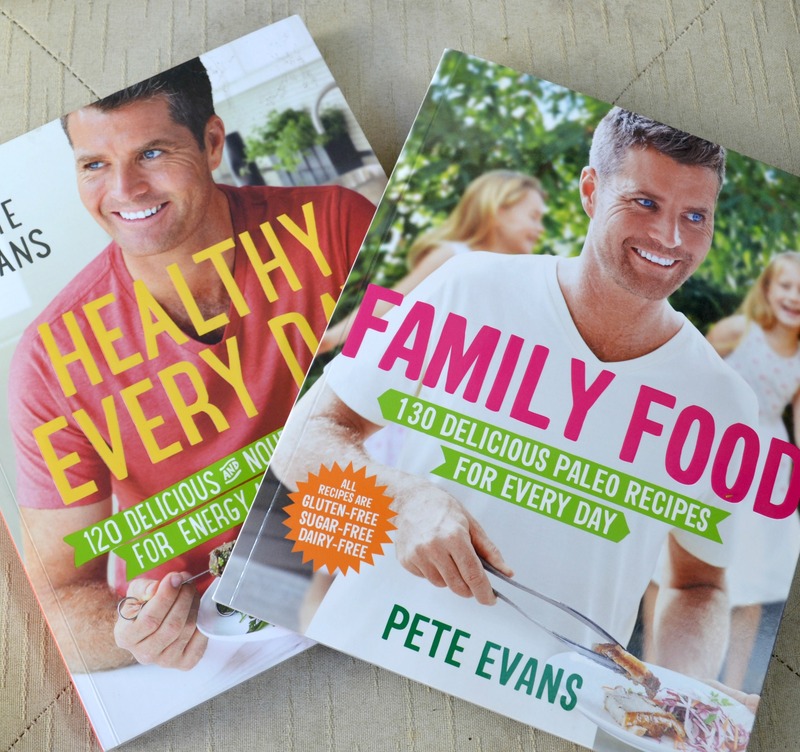 For my birthday in September I was given a copy of Healthy Every Day by Pete Evans. I have tried out many of the recipes from the book this month. It has become my go-to recipe book. All recipes are gluten, sugar and diary free and use lots of fresh veggies, nuts and seeds. I liked the book so much that I pre-ordered Family Food which was released and arrived in the last week of the month. Also this month I have been reading Helen Garner’s This House of Grief. It is such a sad and shocking story but so well written. Helen Garner’s ability to bring to life what must have been many tedious hours in the courtroom, to tell a compelling story without sensationalizing, and to conjure compassion, is amazing. i belong to an eco-feminist community (Sophia’s Spring) which meets on Sunday mornings at CERES Environment Park and one Sunday during October I took a turn to provide morning tea. It was a great chance to test out a number of recipes from the Healthy Every Day book. 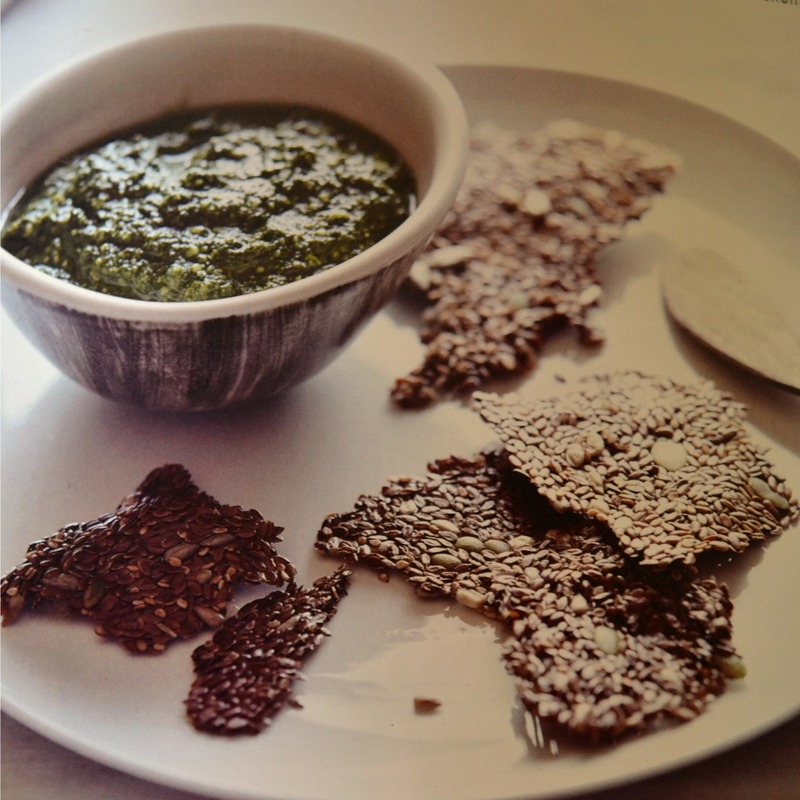 I made basil and parsley pesto and seed crackers, as seen in the photo above, which comes from the book as I didnt think to take any photos on the day. The seed crackers are unbelievably easy – basically just seeds and water. And really yummy (IMO). Cashew cheese and beetroot humous were other recipes tried from the book and served with fresh carrot, celery, cucumber and tomato sticks. I also made a gluten free apricot and lavender cake and a totally unhealthy white chocolate rocky road slice.